It’s the second to last dinner for my eldest before he heads off to college so I picked an old favorite from his childhood. 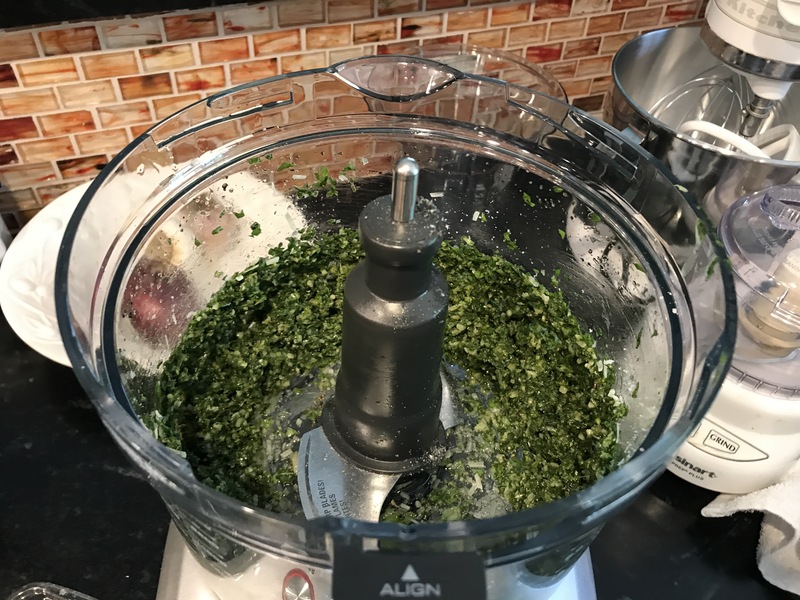 It’s one that we all love and has carried through as the years go by, of course it’s hard to go wrong with homemade pesto. When we found out that he was allergic to nuts I went on a mission to find one that I liked that was nut-free. This one has stood the test of time. 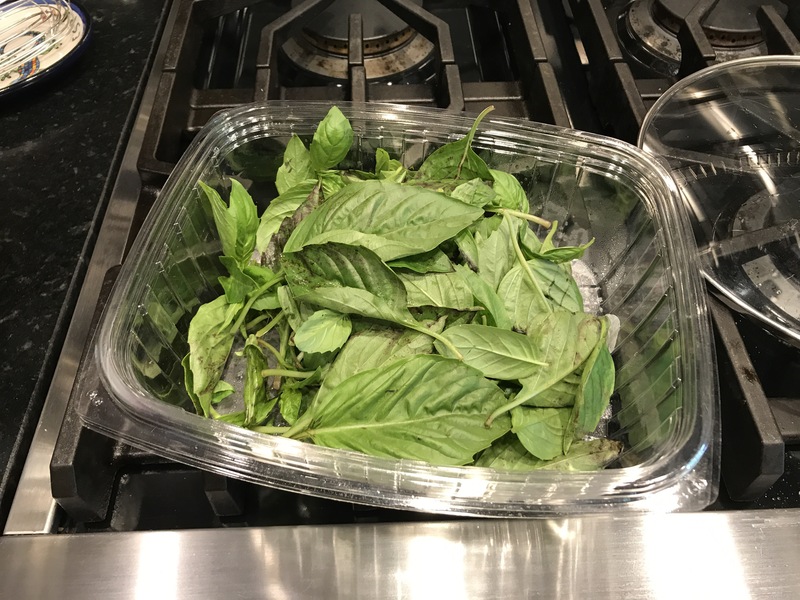 I started with my basil: a mix of Thai and regular basil (any basil works, I had extra since I’m using it in my dessert tomorrow too). 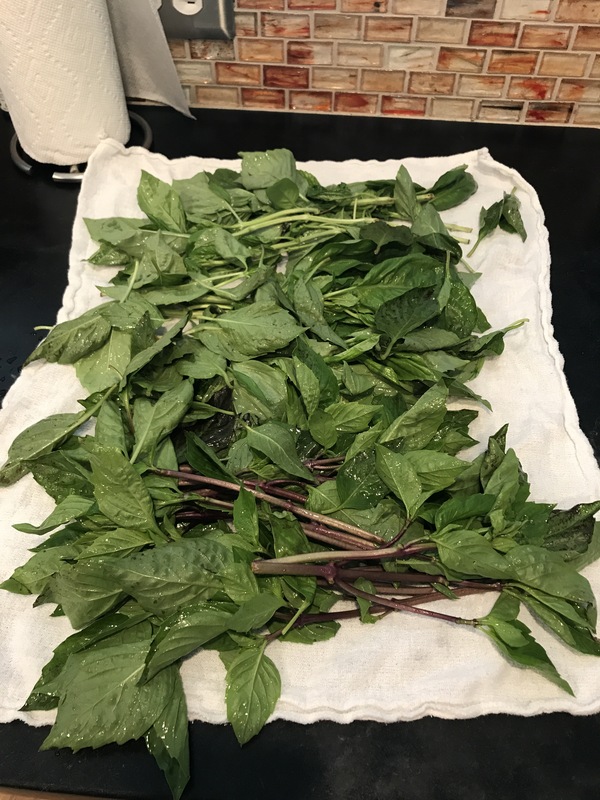 Once it was cleaned I pulled off my leaves and separated it out into portions. 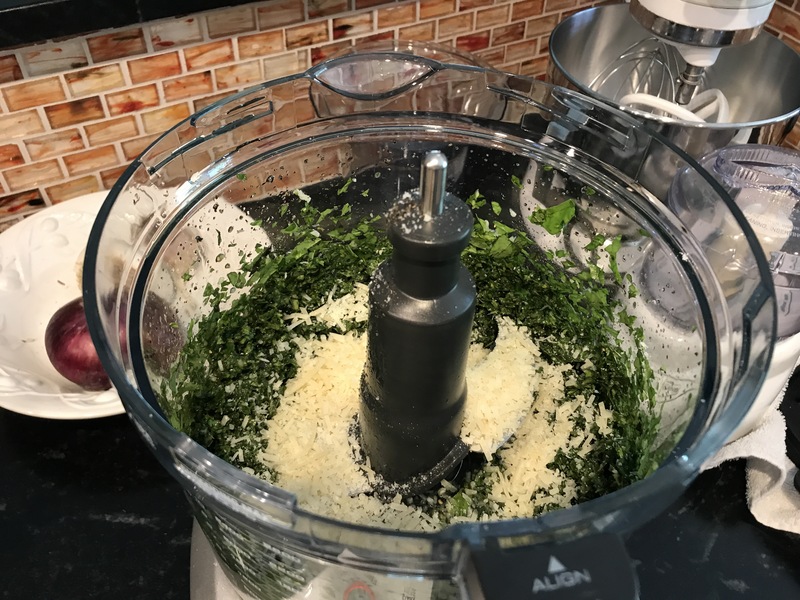 The portion for the pesto went into the food processor with a few cloves of garlic. Then I started the grill and the water. 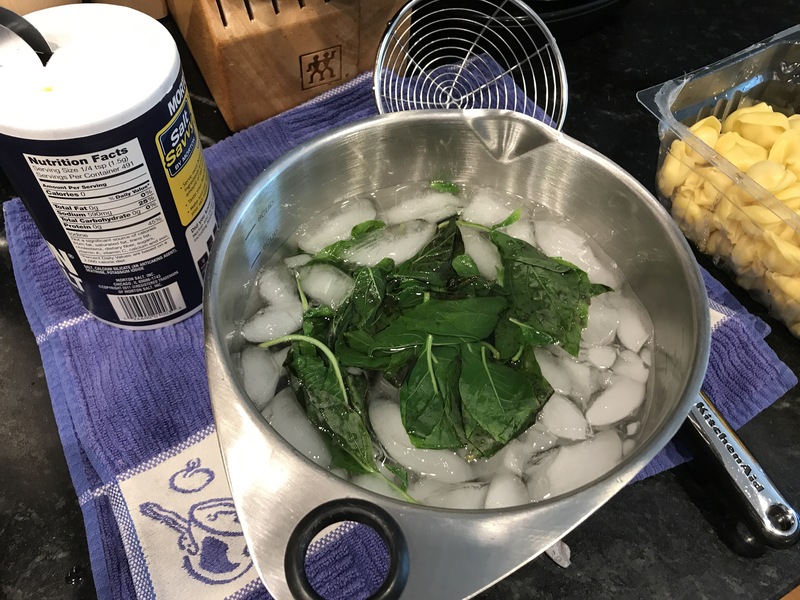 The Italian sausage took 10 minutes so I started those first, then came in and blanched the basil for tomorrow in my pasta water. 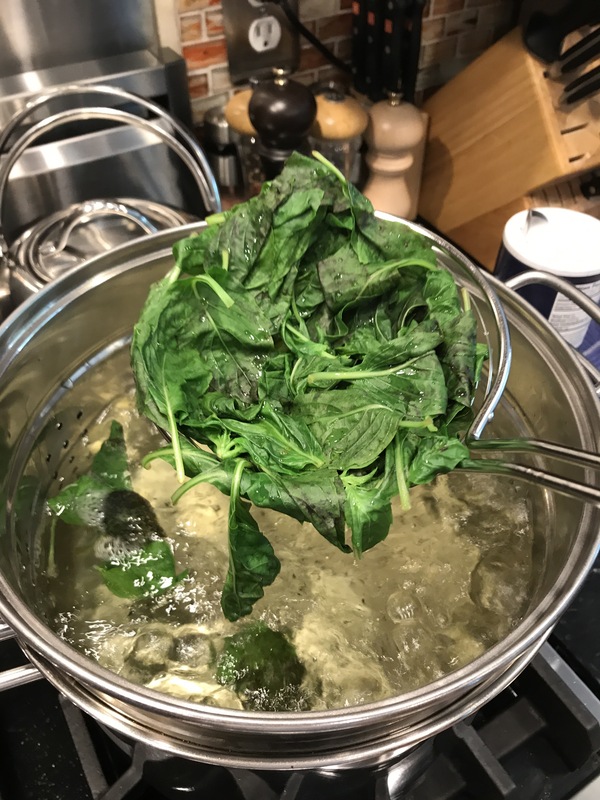 Then I cooked the pasta in the basil water and turned the sausage. 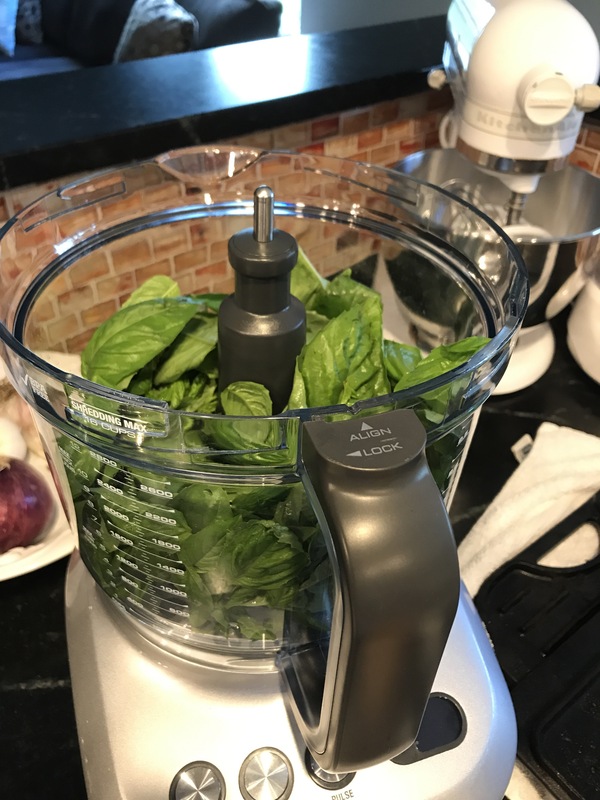 I blended up the pesto in the food processor just before the pasta finished, adding salt, pepper, and olive oil after the basil was chopped and finishing with the Parmesan. 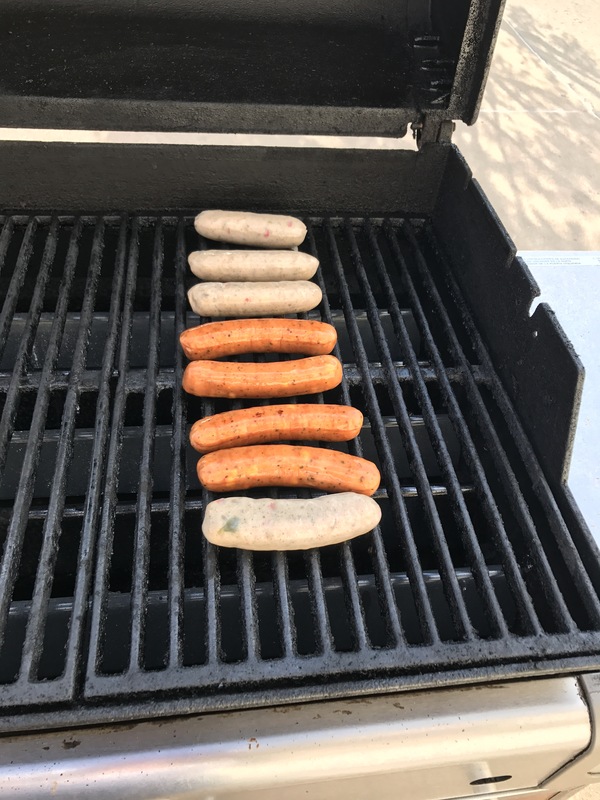 While the pasta drained I pulled the sausage off the grill. Then I came in and tossed the pasta – dinner is served and I have a happy boy. 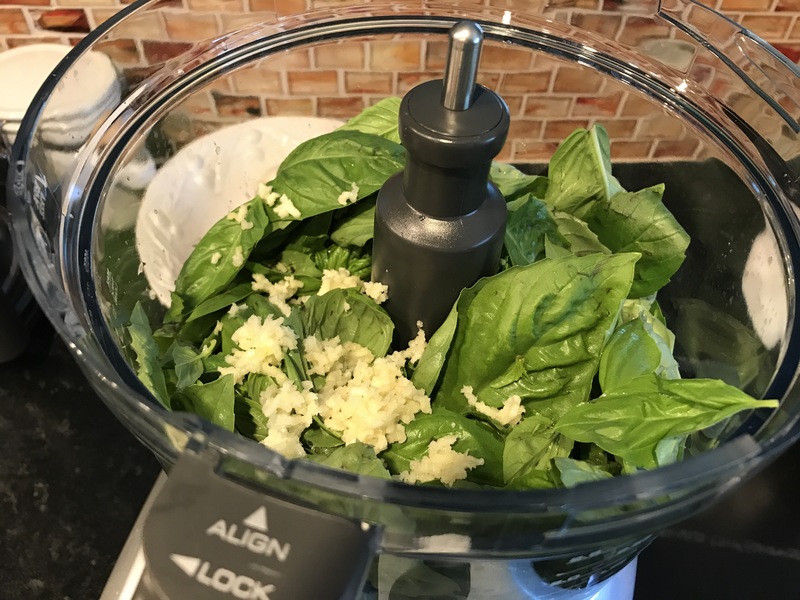 In a food processor, pulse the basil and garlic until roughly chopped. With the machine on, slowly pour in the oil until just blended. 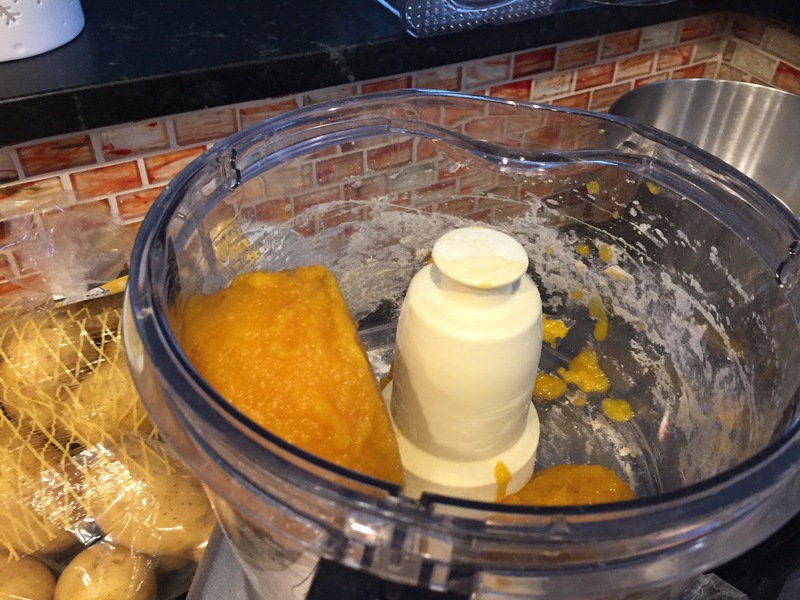 Stir in cheese, salt, and pepper and mix until just blended. 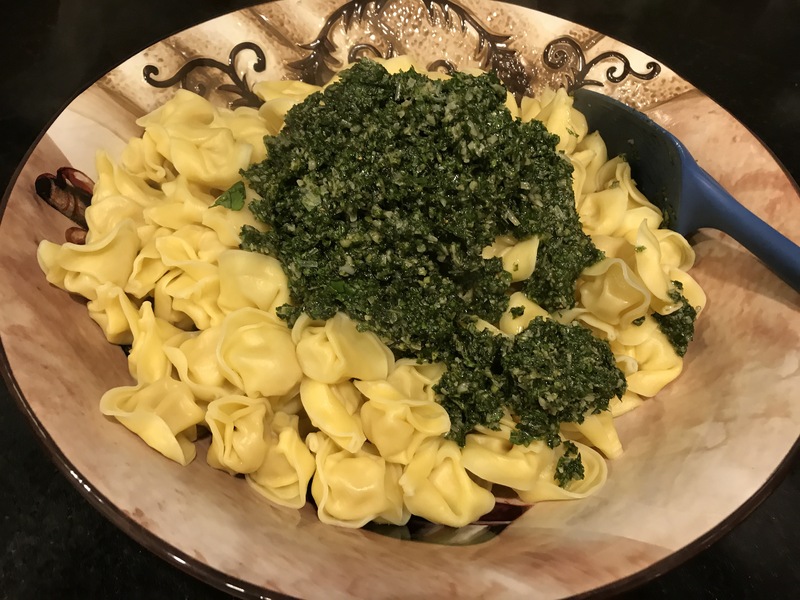 Toss the pesto into cooked tortellini. This can be served warm, at room temperature, or cold. 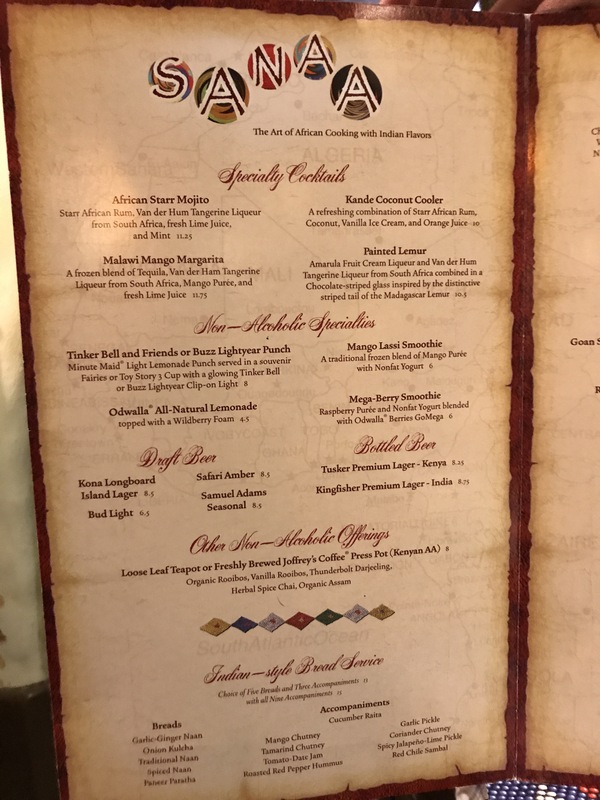 Time for another disclosure, this is my second favorite restaurant at Disney World and there are days I have difficulty making that ranking decision between Sanaa and California Grill. 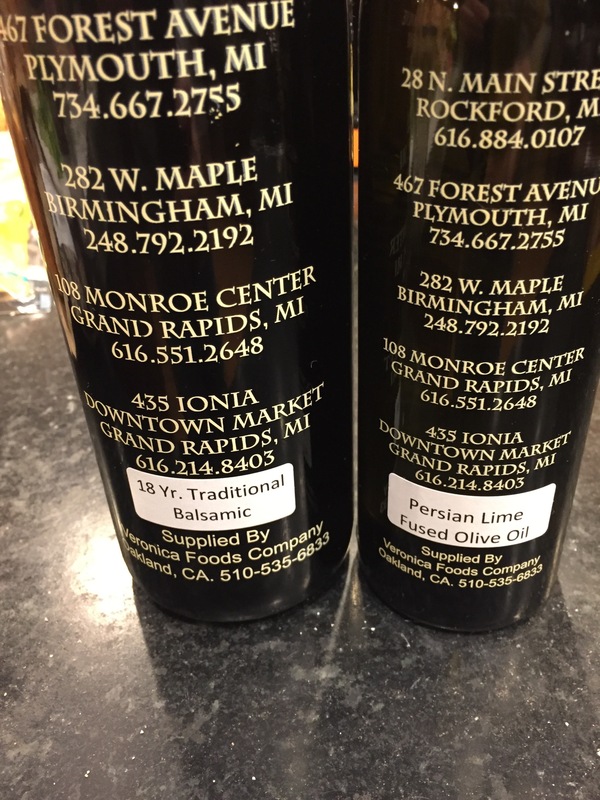 They are dramatically different restaurants both in food and price, but the quality shines through in both locations. The food is so unique here that we verify all of our dishes are nut and fish free so that we all can share bites of everything. 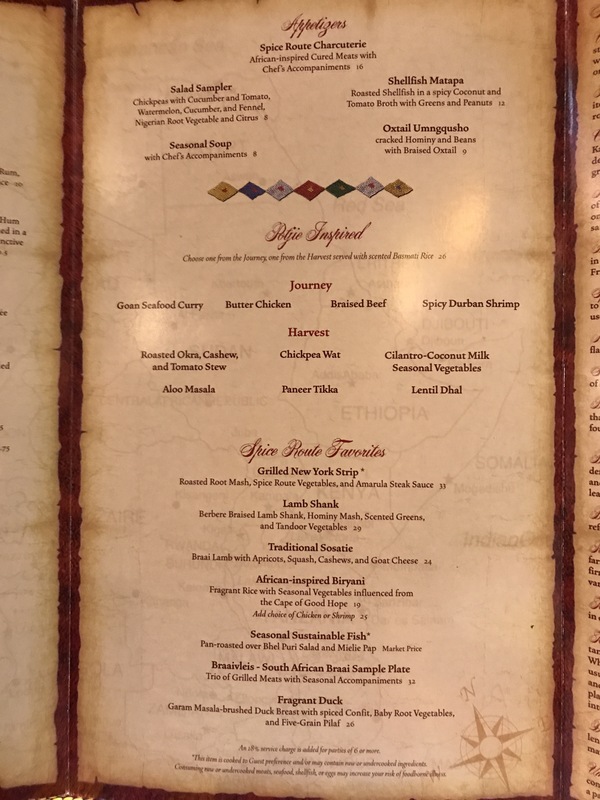 I remember our first visit to Sanaa and encouraging my husband and boys to try the bread service with all of the toppings, they weren’t sure about it, but I had visited India and knew how good this could be. Sanaa executes this perfectly and we now order it every time we visit; yesterday was no exception and it vanished quickly. 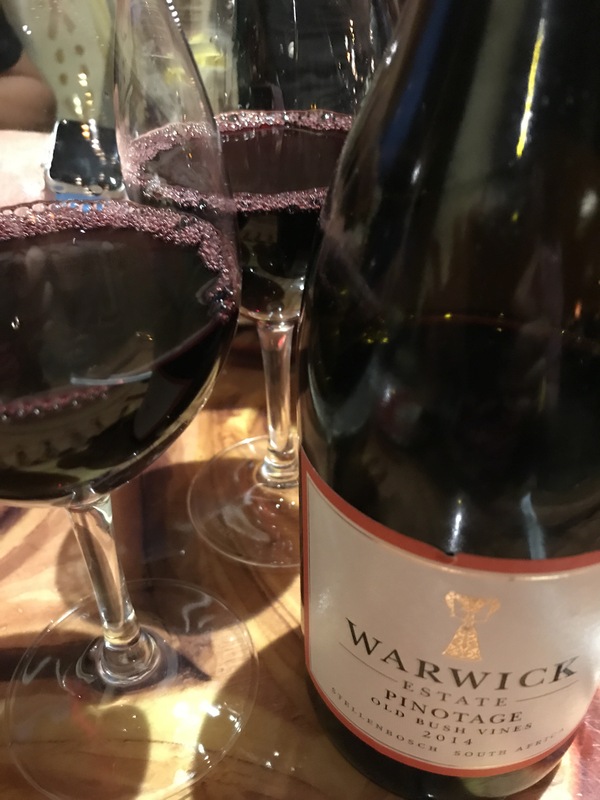 We ordered a South African wine to pair with our food; most of the menu is African and Indian flavors and my husband and I learned long ago that a wine local to the type of food will pair well. 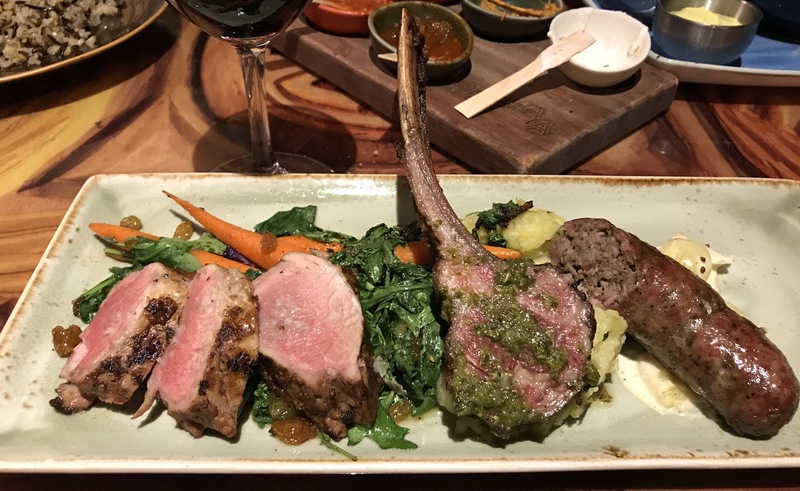 All of our dishes were amazing, and I have sincere compliments to the chef; that original visit inspired me to bring lamb into my own cooking. 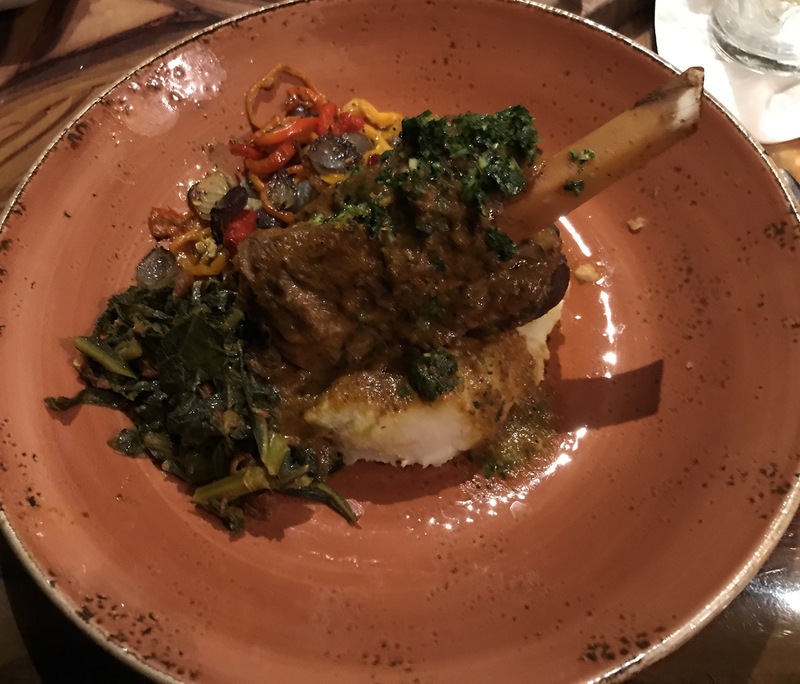 My eldest ordered the lamb shank, on our original trip it was the youngest, and I tought them both to make sure they get the marrow from inside the bone as well as the meat from outside. After the duration of cooking it’s perfect. The meat simply falls off of the bone when you pick it up: perfection. I selected the duck; I can’t get it fresh and I haven’t had success reproducing recipes with frozen so this has not made it into my repertoire. It was served a perfect medium rare, with very crispy skin and duck confit (made from the legs and thighs) on the side. Like the lamb and other red meats, when cooked correctly it simply melts in your mouth. My husband opted for the Braaivleis, a trio of grilled meats; the meats aren’t ever listed on the menu as they are subject to change. His came with pork tenderloin, lamb chops, and a boar meat sausage. 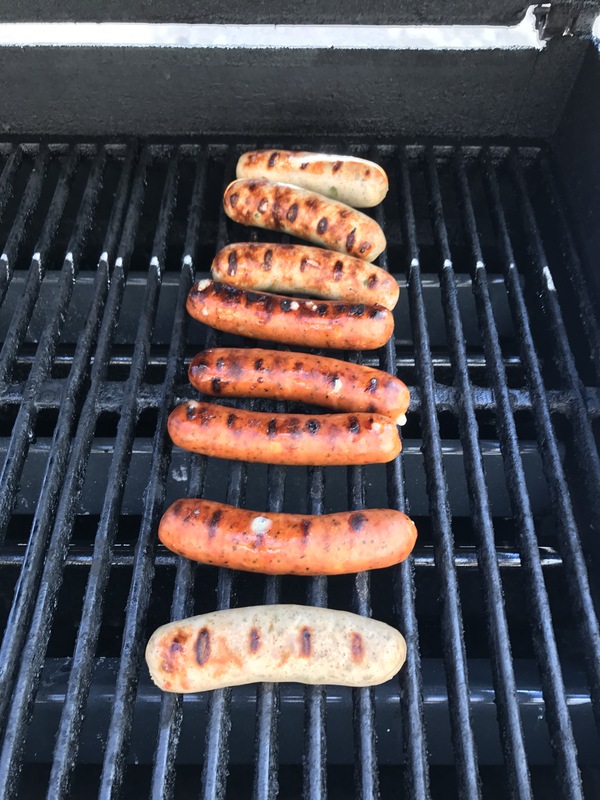 All were perfect and flavorful, with the sausage as a clear favorite of my husband and boys due to the unique flavor profile. 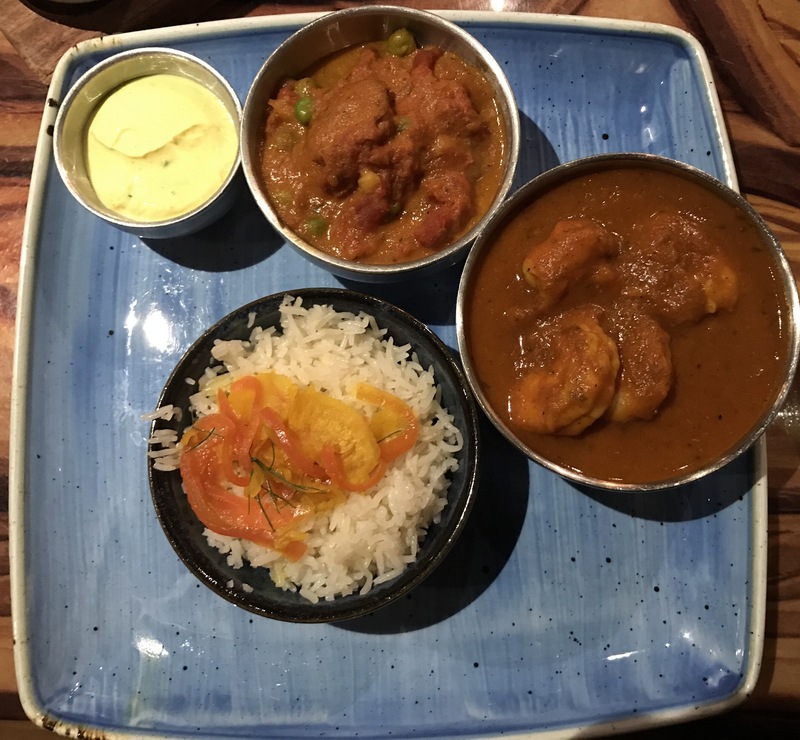 My youngest selected the Spicy Durban Shrimp with Aloo Masala after researching all of the terms so that he knew what he was ordering. Again, another amazing dish, the shrimp were full of flavor, and we may have to start ordering extra bread to soak up the sauces. When it comes to nuts, the desserts are different story and my eldest made sure he ate enough that he didn’t want dessert. My youngest got the Spice Trade Candy Bar and my husband and I split the Kenyan Coffee Petit Entremet. Both were amazing. 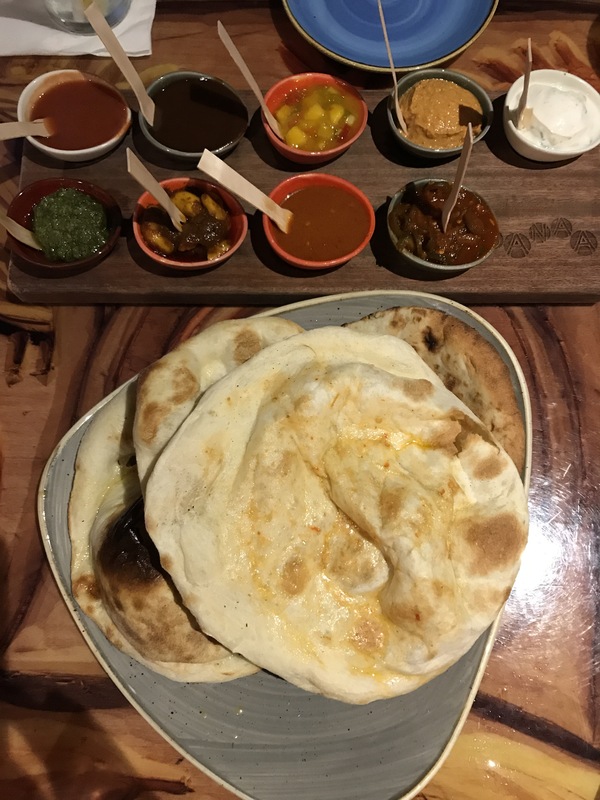 If you are willing to be a bit more daring in food options, definitely try Sanaa. Yesterday we enjoyed another favorite, not for dinner, but rather for a very late lunch. We try to do this at least once during our longer trips at Disney to get a pizza “fix” which we enjoy at home at least once a week. 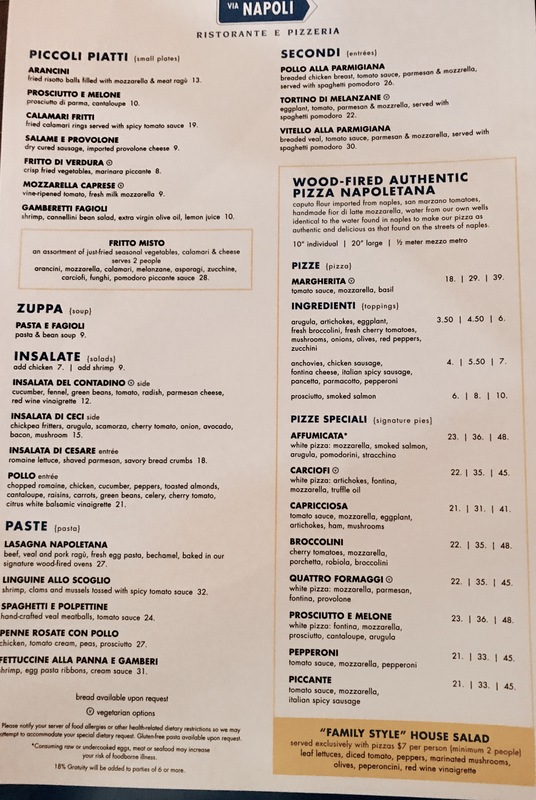 Via Napoli, is our well-established favorite for this with their flour imported from Italy, San Marzano tomatoes, and in-house made mozzarella. 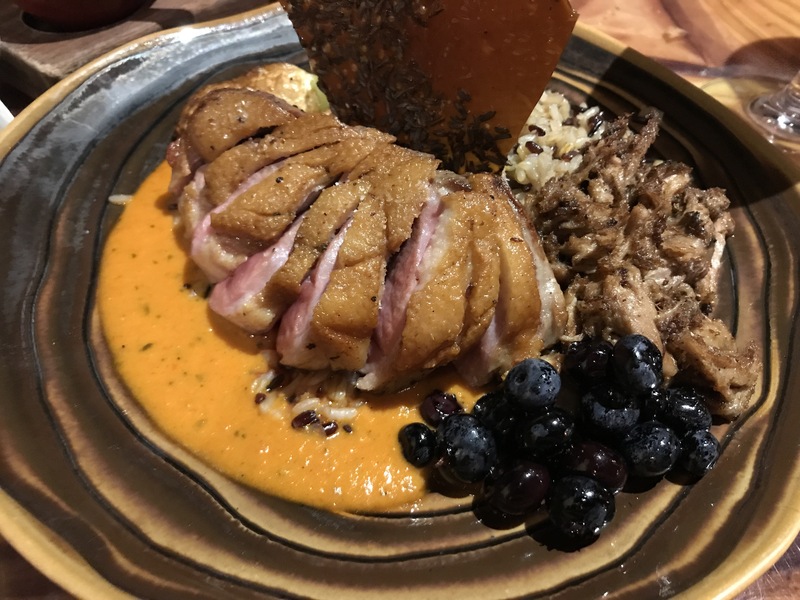 In the future, we may have to try Blaze in Disney Springs…maybe. 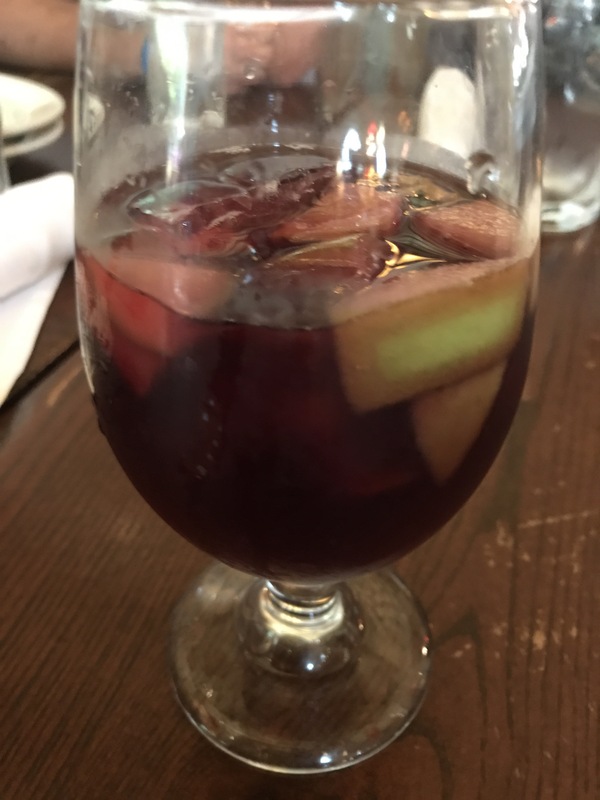 The meal is simple, red sangria, an appetizer (prosciutto and melon this time), a family style salad, and a large pizza. 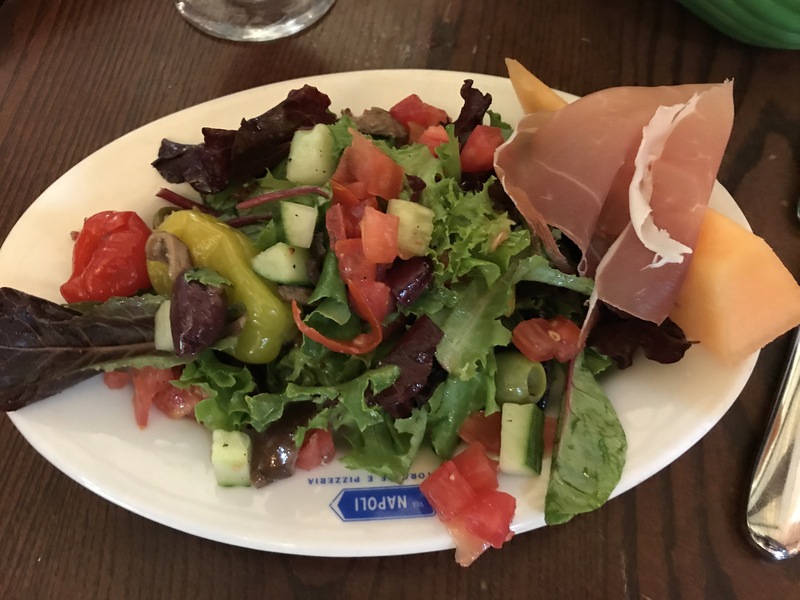 The melon and prosciutto is easy to do at home, the saltiness of the prosciutto and the melon are simply a perfect complement. This is a very elegant simple appetizer on skewers if you are looking for something unique. 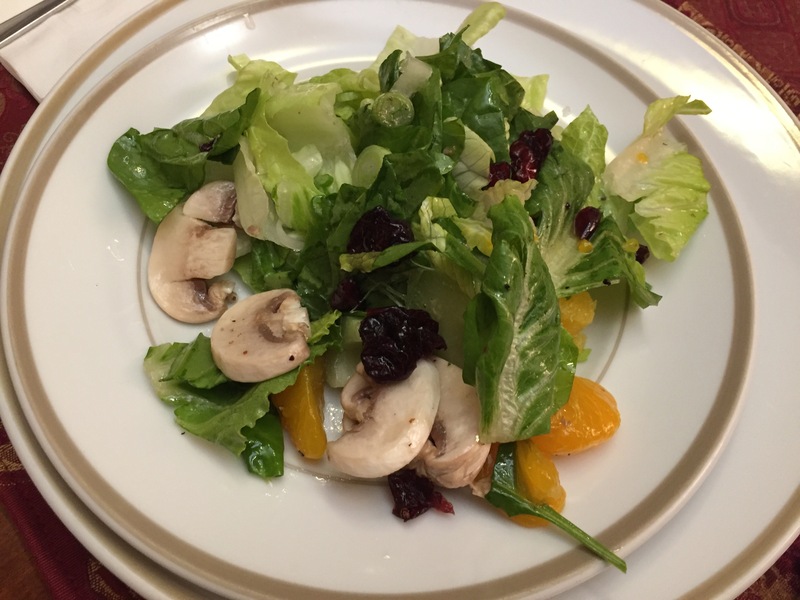 And the salad was loaded with tomatoes, cucumber, green and Kalamata olives, marinated mushrooms, and peperocini and peppadew peppers with a simple red wine vinaigrette was perfect in the heat of the day. We followed this with a pizza with some of our favorite toppings; this is always the difficult decision since we love them all. 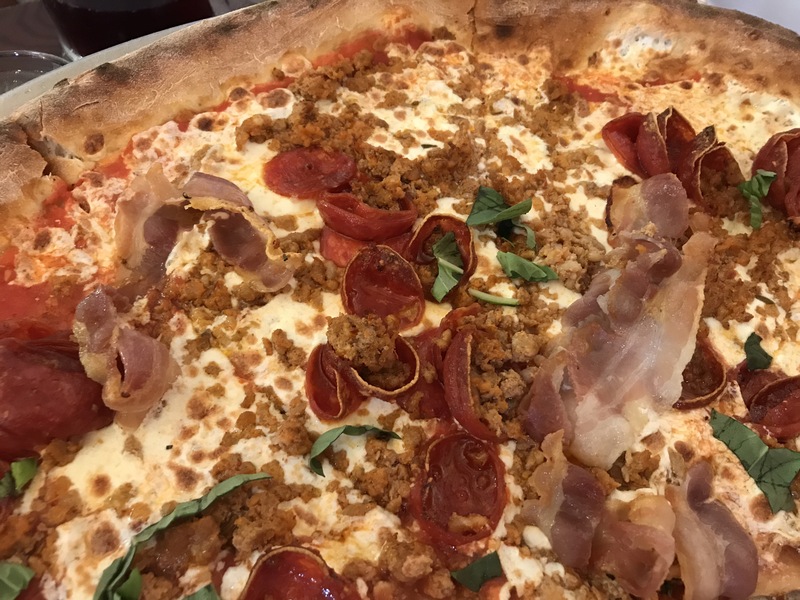 We selected Italian sausage, pancetta, and pepperoni. We rounded out the day with snacks as we got hungry. That’s what I decided to call them anyway, Pumpkin Ravioli with sage butter. My husband’s parents have been taking care of some family matters and as a result missed Thanksgiving with us (I know it was really hard to resist the garage turkey). They arrived back so I decided to do a special Sunday dinner and try to make something that I had not attempted before. 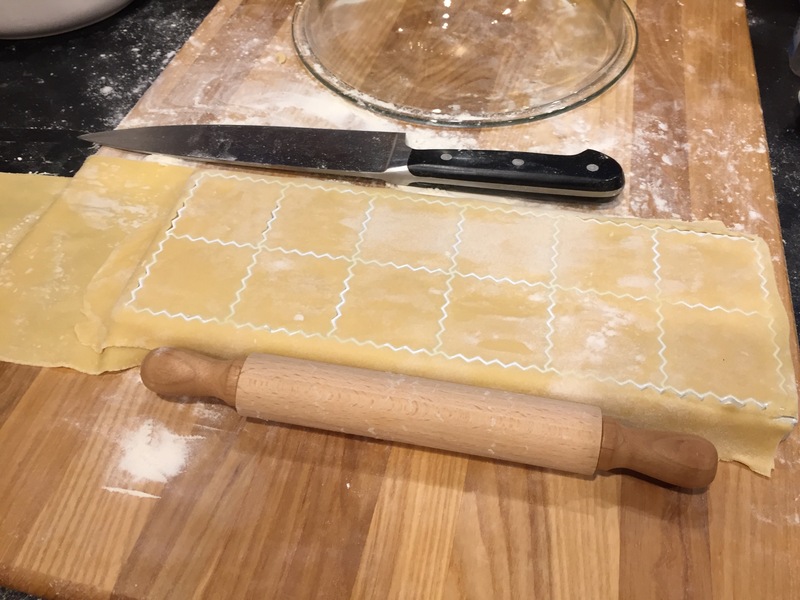 As you know from my posts it is fairly recent that I have attempted and tackled homemade pasta. 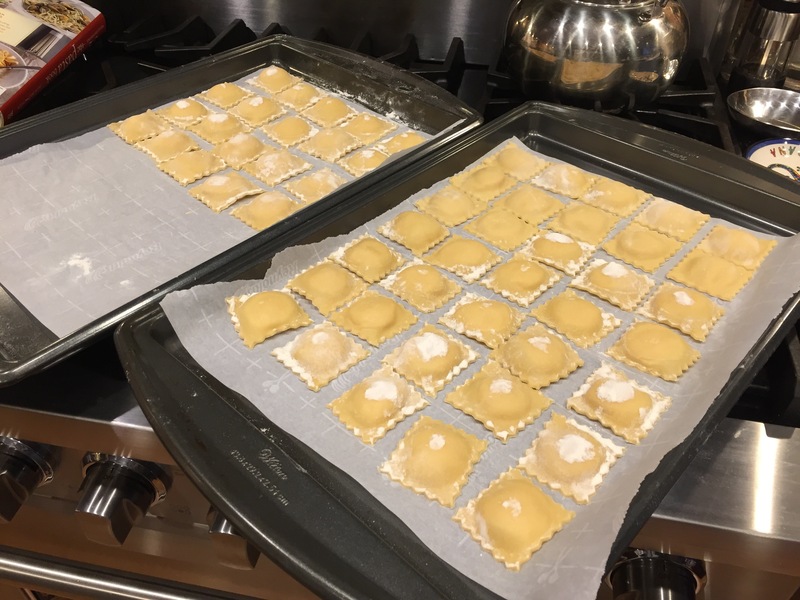 For several years I have been considering a recipe that I found at Williams-Sonoma, that also just happens to be in the pasta cookbook I received last Christmas: Pumpkin Ravioli. 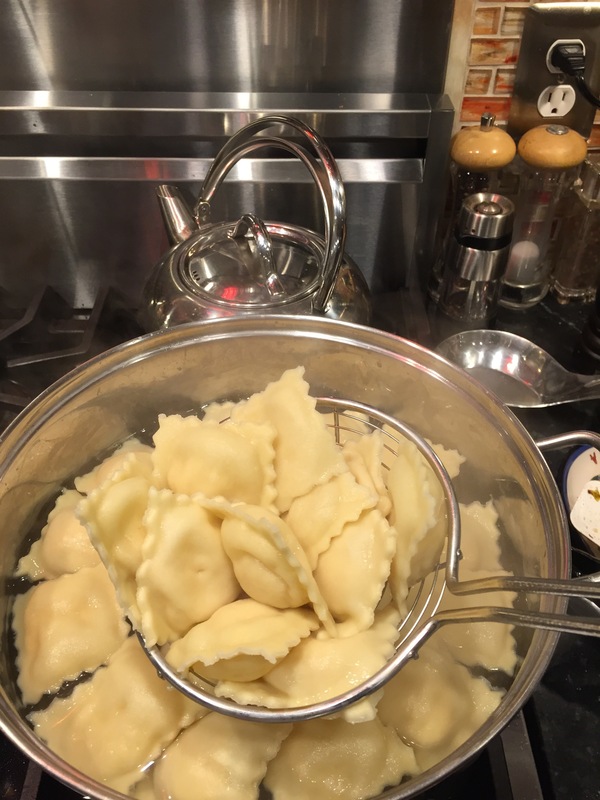 In additition to being inspired by the recipe, I have had a ravioli form since we got married that I had not used. As intimidated as I was by pasta, I was equally intimidated by a filled pasta. 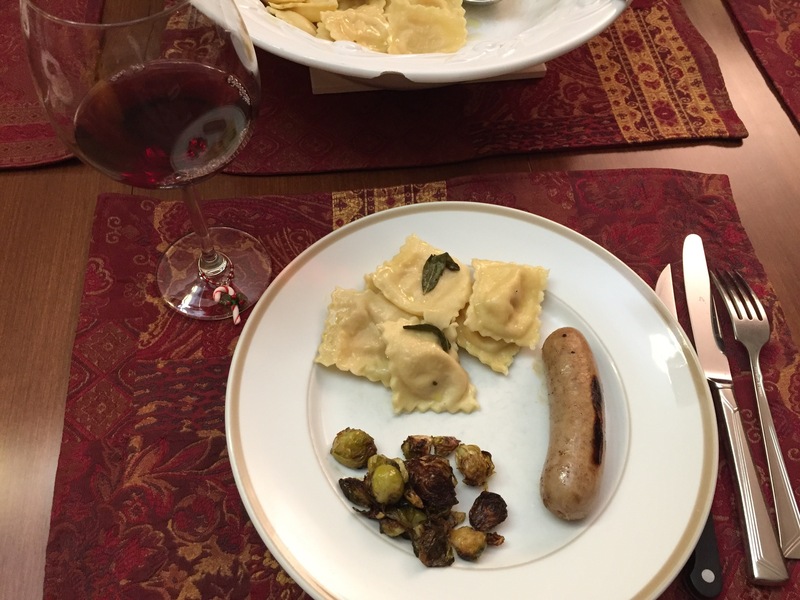 To go with the ravioli I decided on chicken apple sausage and roasted Brussels sprouts. It was a busy day with an early morning game and lots of shoveling so I was thankful to my boys who both helped in the kitchen. 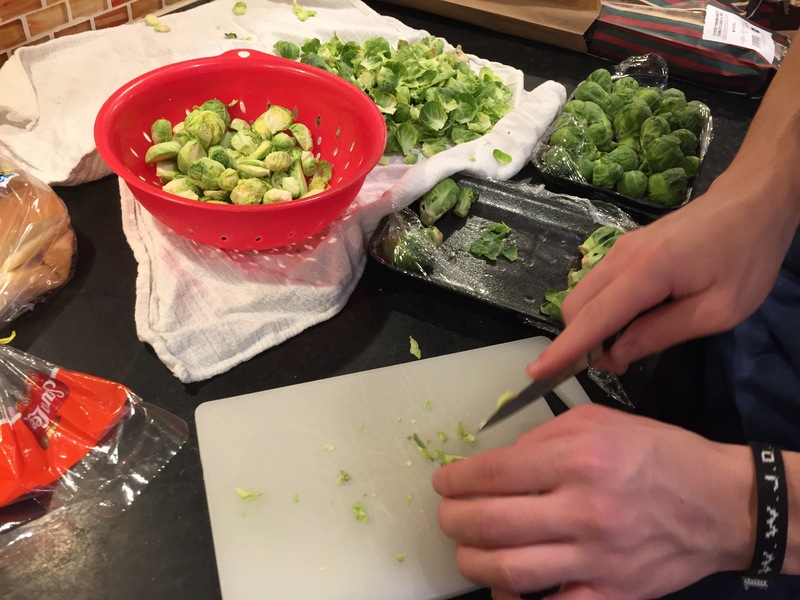 While my elder son shredded a chicken for the following night’s dinner my younger son cleaned the sprouts and I got to make the pasta dough. 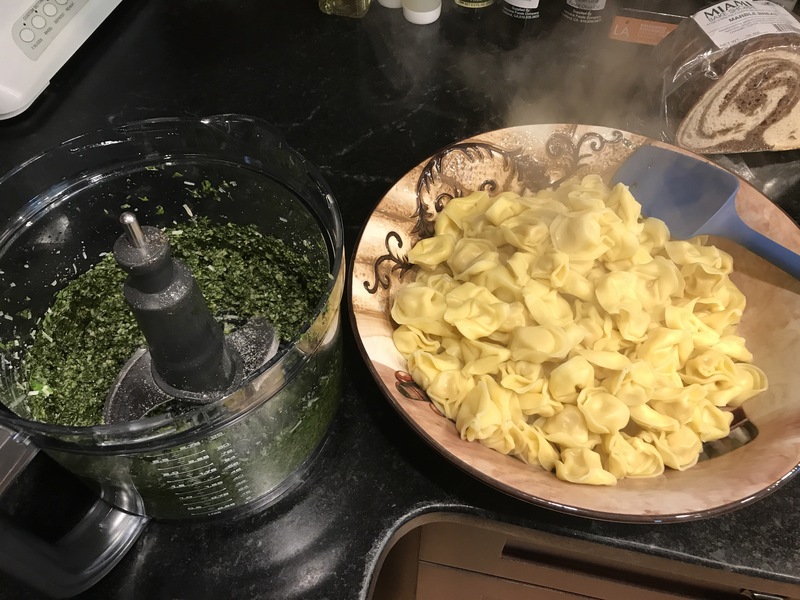 The pasta recipe is from the same cookbook as the ravioli, and for efficiency I use the food processor. 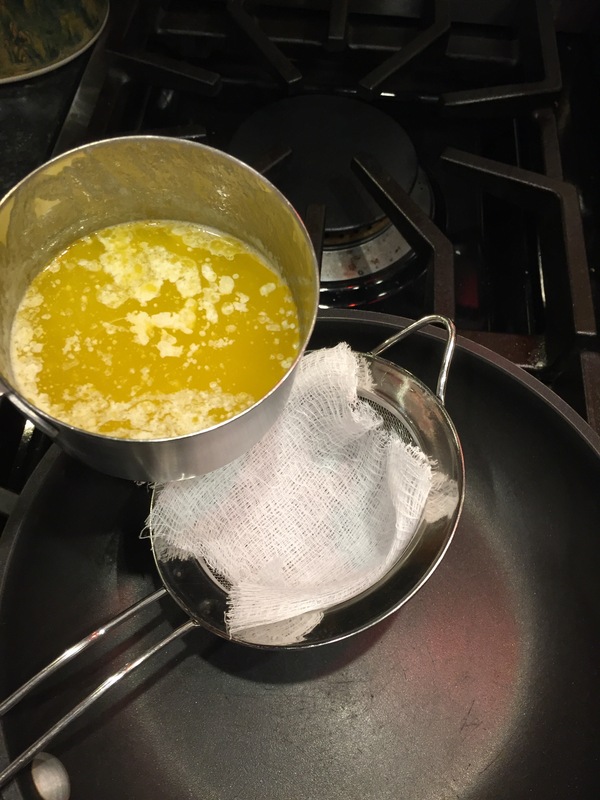 Add the oil to the eggs and then pour them into the bowl of the processor. 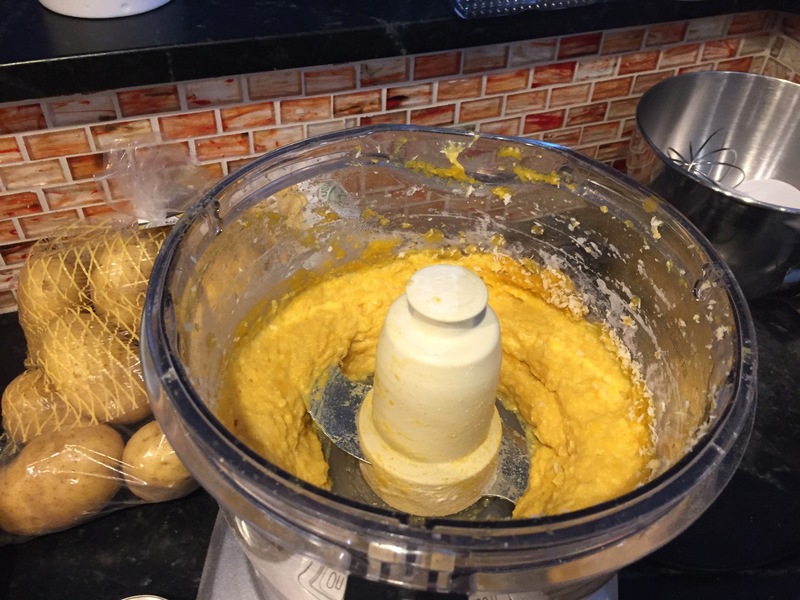 And then mix, using the pulse function, adding flour as needed until it holds together but isn’t sticky. Once it comes together, knead it for 10 minutes on your bread board until you have a smooth dough. Then let it rest. If you have gotten out all of your ingredients ahead of time, there is enough time to put together the filling while the dough rests. Alternatively, you could make ahead of time and keep it chilled. While the recipe calls for 1 small pumpkin (~1 lb. ), I opted to use my frozen pumpkin (canned would be fine too). And then I mixed in the rest. 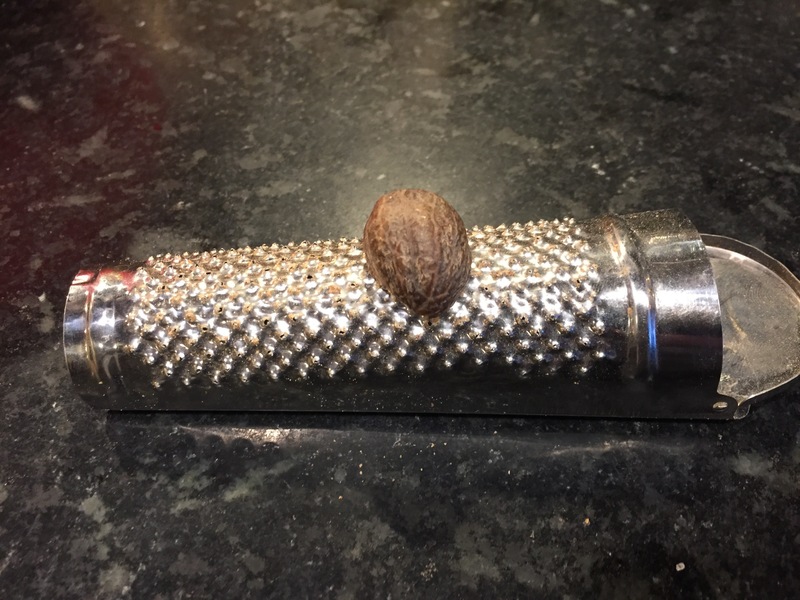 Always better to grind whole nutmeg! By that time my dough was ready to start rolling. I sat the layers aside between sheets of floured parchment under a damp towel until the dough was all rolled out. To fill the pasta, I began by flouring the form. 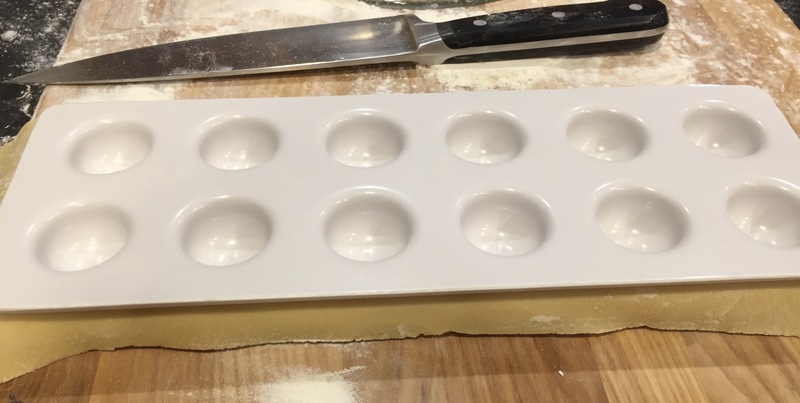 Then 1 sheet goes on the bottom piece (with the holes) and then you press gently with the top piece to make the pockets for filling. Then fill each spot with about 1 teaspoon of filling. 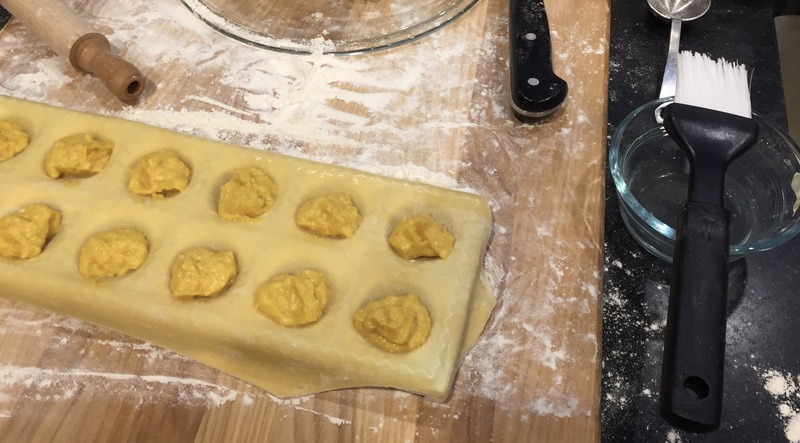 To make sure each ravioli seals well, brush the edges of each with a pastry brush and cool water. Lay a second sheet over the top, gently lifting the edges and pressing to ensure no air bubbles are trapped. The use the small rolling pin to seal them firmly and cut the edges. Firmly tap them out onto a floured parchment lined baking sheet(s). Refrigerate until you are ready to cook them or freeze them. 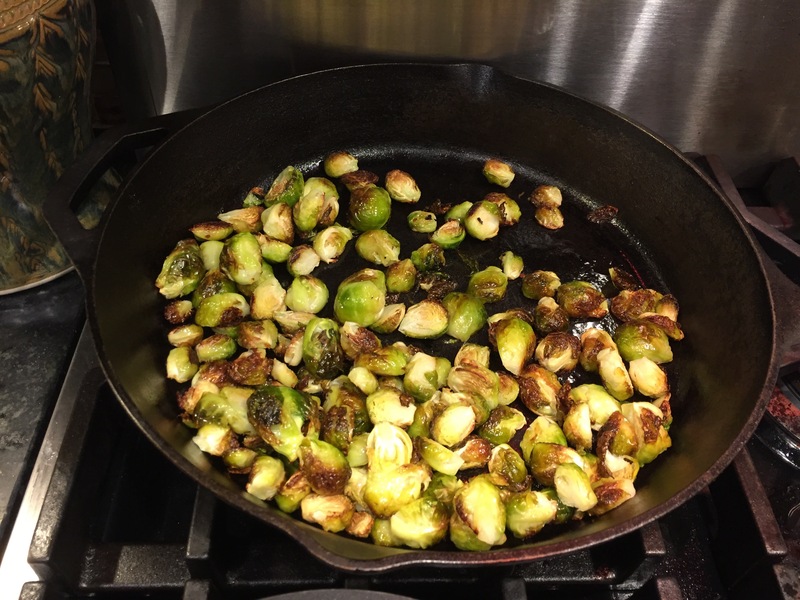 I clarified my butter and started roasting the Brussel sprouts before starting my water. 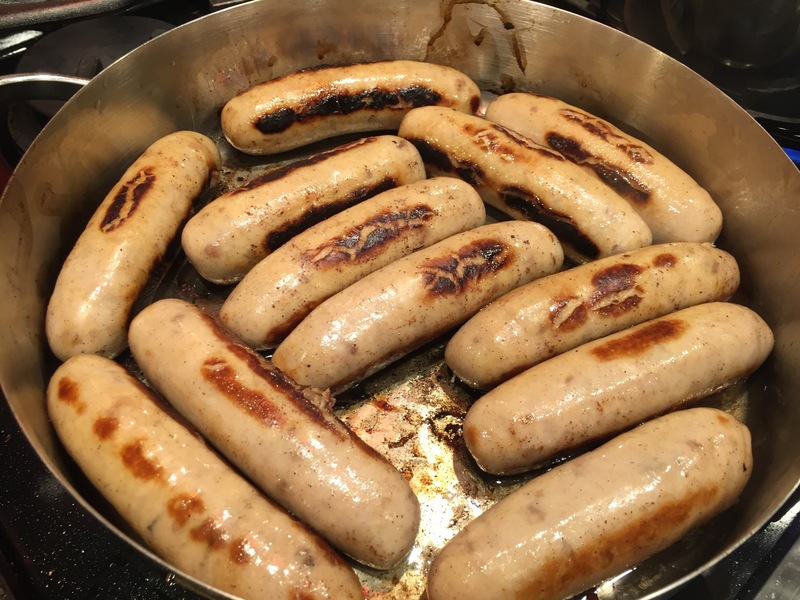 I also started browning some chicken-apple sausages that I sprinkled with a dash of cinnamon. When the sprouts and sausages were done, I made the sage butter and boiled the pasta. Dinner is served! With a wonderful salad from my MIL. Entrées, Not Shared, Pastas, Tested and Approved! 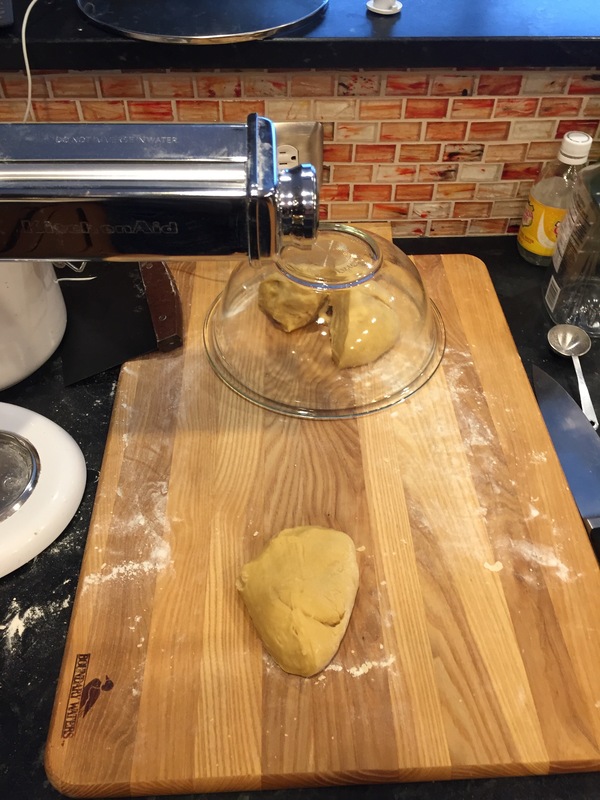 To make the dough by hand, measure the flour onto a work surface, mix in the salt and shape the flour into a mound. Using your fingertips, make a well in the center. 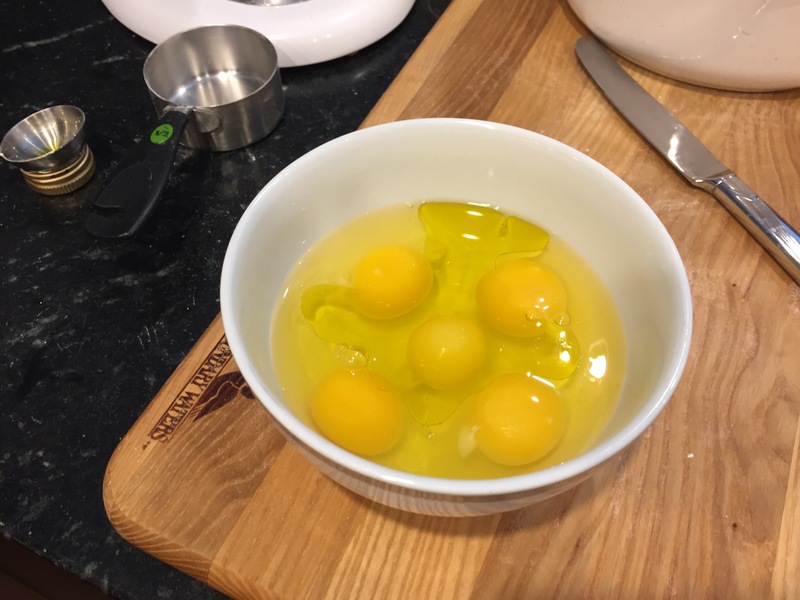 Break the eggs into the center of the well and add the olive oil. 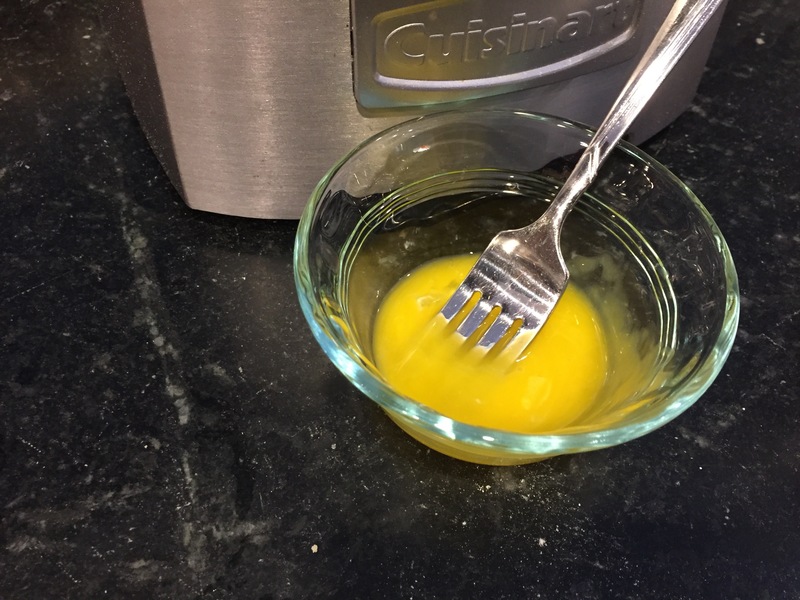 Using a fork, beat until the eggs and oil are blended, making sure the liquid does not breach the walls of the well. 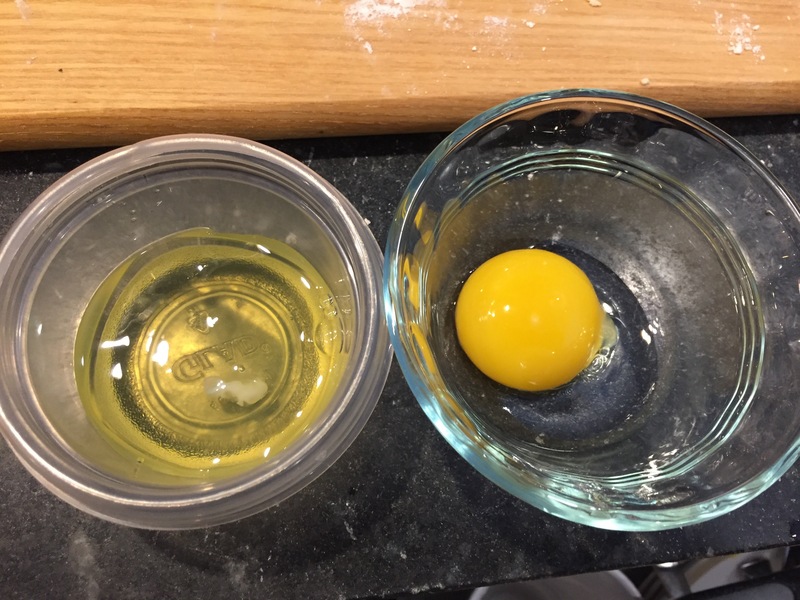 Crack the eggs into a liquid measuring cup and remove any stray shells. 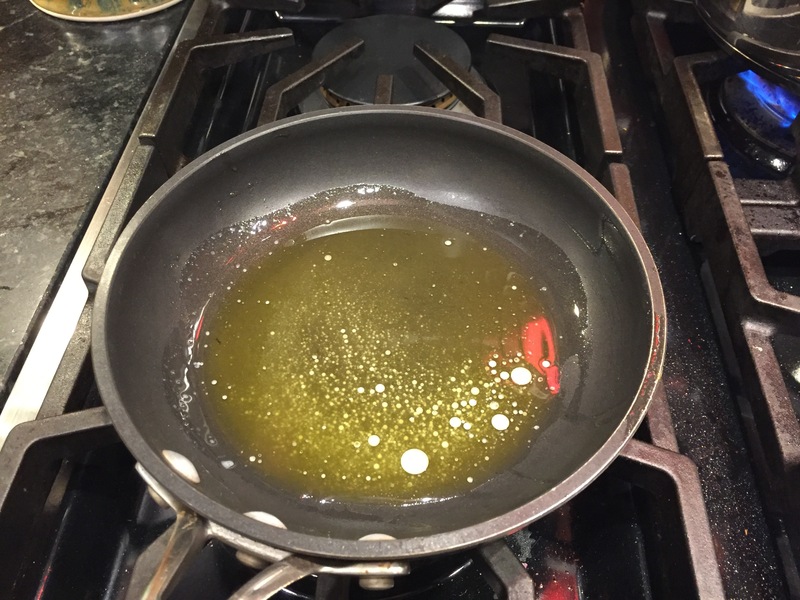 Add the olive oil; there is no need to stir. Pour the eggs and oil into the work bowl. 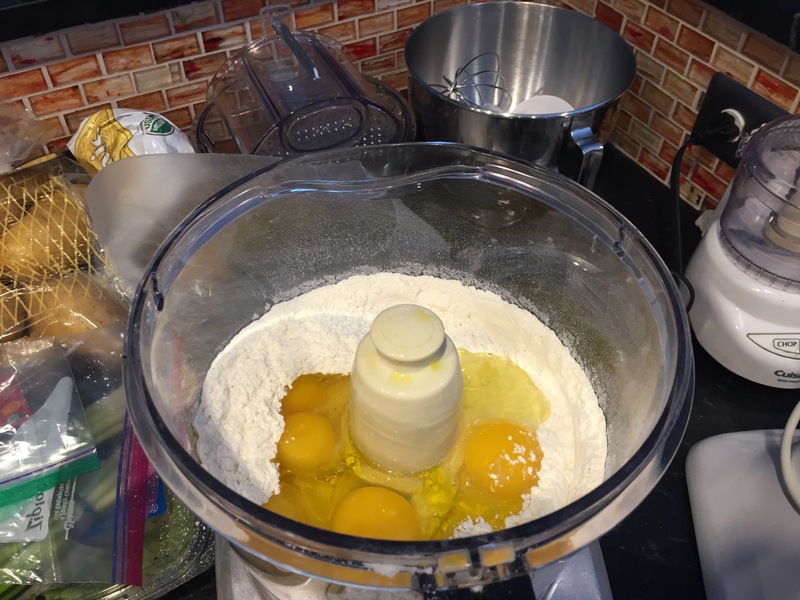 Process until the flour is evenly moistened and crumbly, about 10 seconds. Test the dough by pinching it; if it is very sticky, add more flour, 1 Tbs. at a time, processing until it is incorporated. After about 30 seconds total, the dough should come together in a loose ball and feel moist but not sticky. 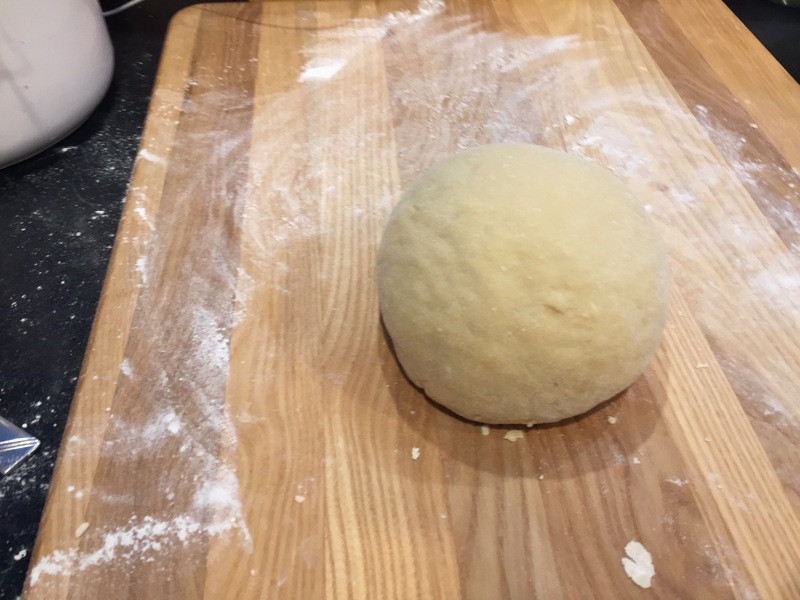 Shape the dough into a ball, cover with an overturned bowl and let rest for 15 minutes before you roll it out. The gluten in the flour will relax, making the dough easier to roll. Do not let it rest longer or it will be too dry. Makes 1¼ lb. dough. 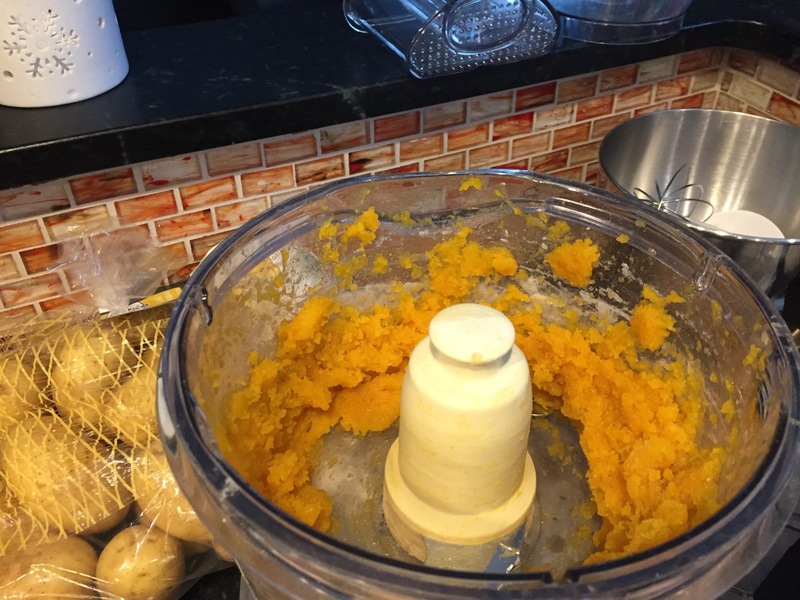 Transfer the pumpkin puree to a bowl. 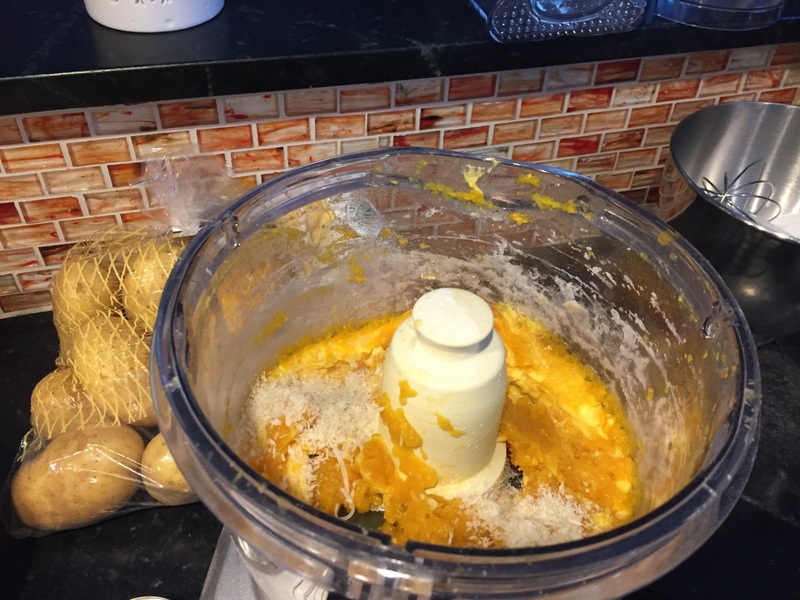 Add the egg yolk, cheeses, nutmeg and sea salt. 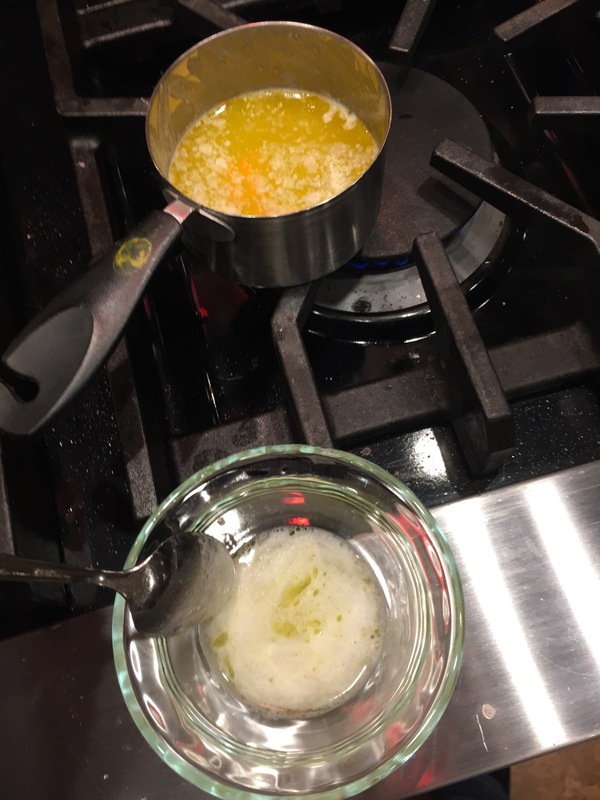 Mix well, adding the bread crumbs as needed to bind the ingredients into a cohesive mixture. Cover the filling and set aside. 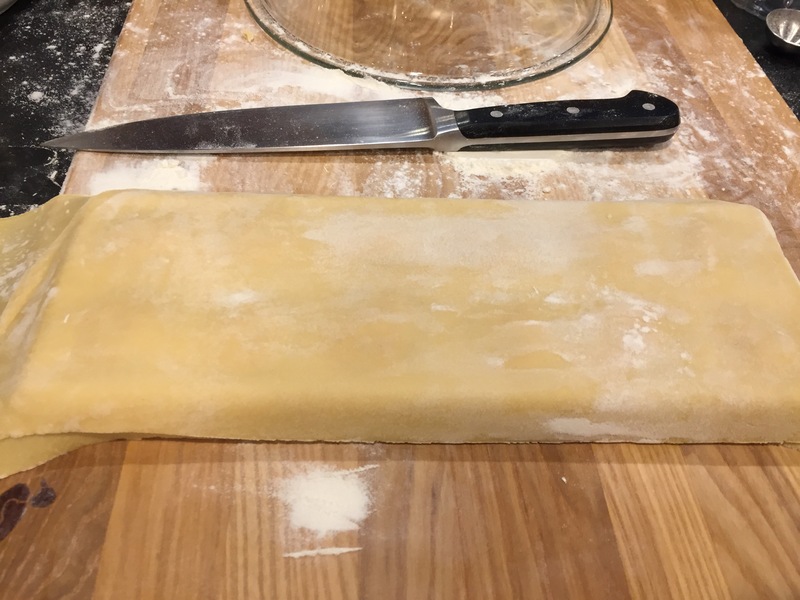 Using a pasta machine or a floured rolling pin, roll out the pasta dough 1/32 inch thick, then fill and cut the ravioli. 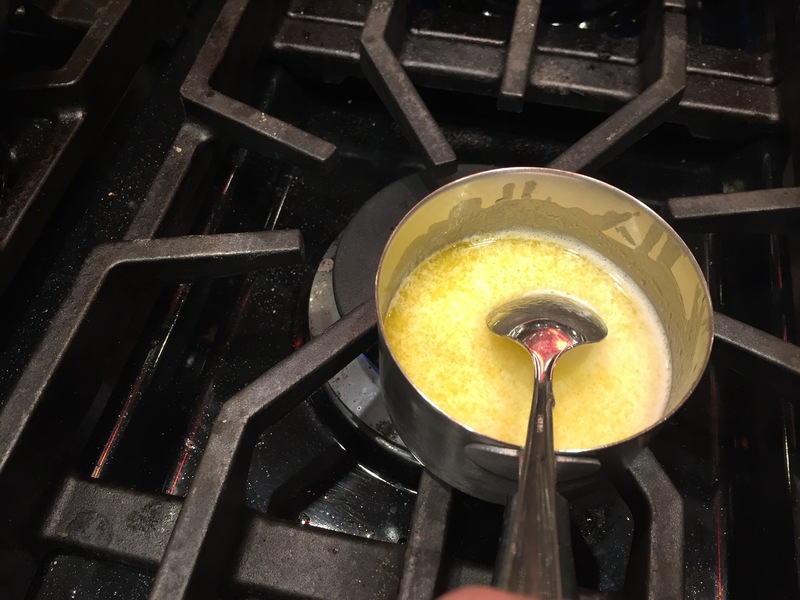 Pour the clarified butter into a small fry pan and place over low heat. 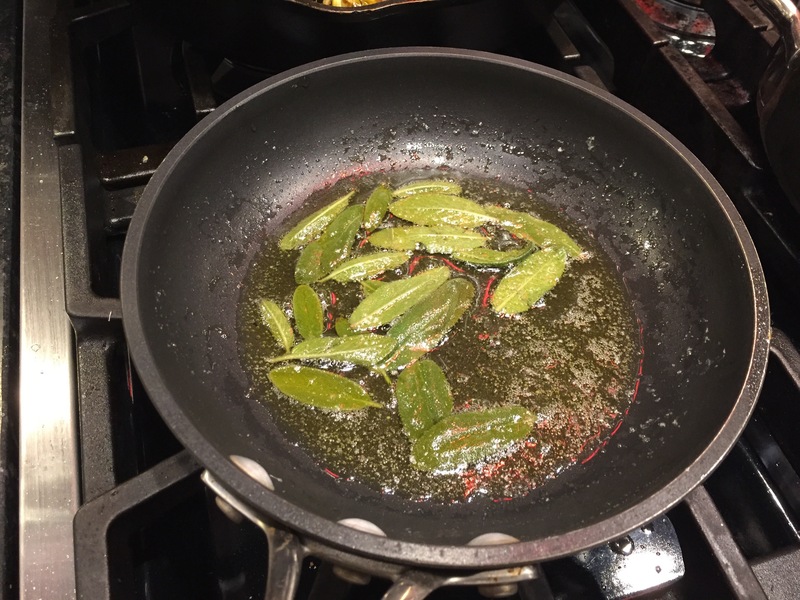 Add the sage leaves and heat until the butter is saturated with the flavor of the sage, 3 to 4 minutes. Remove from the heat and cover to keep warm. 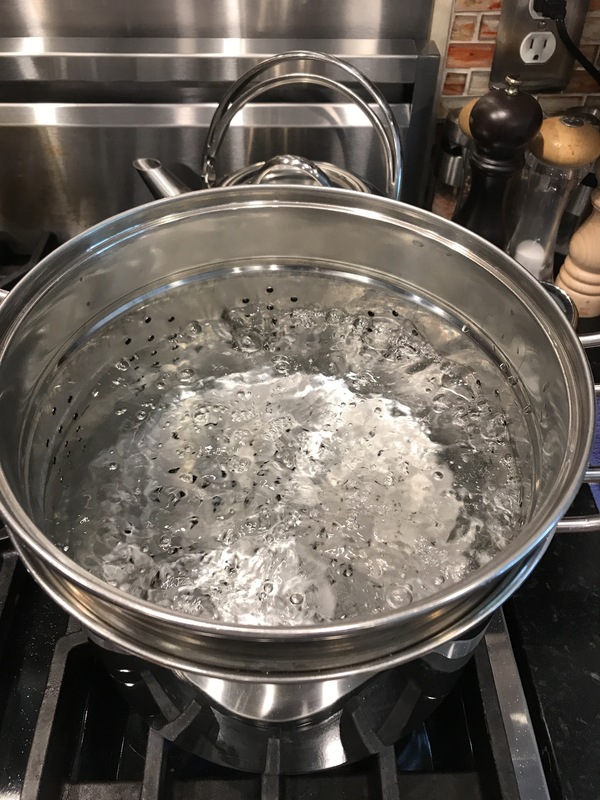 In a large pot over high heat, bring 5 quarts water to a rapid boil. 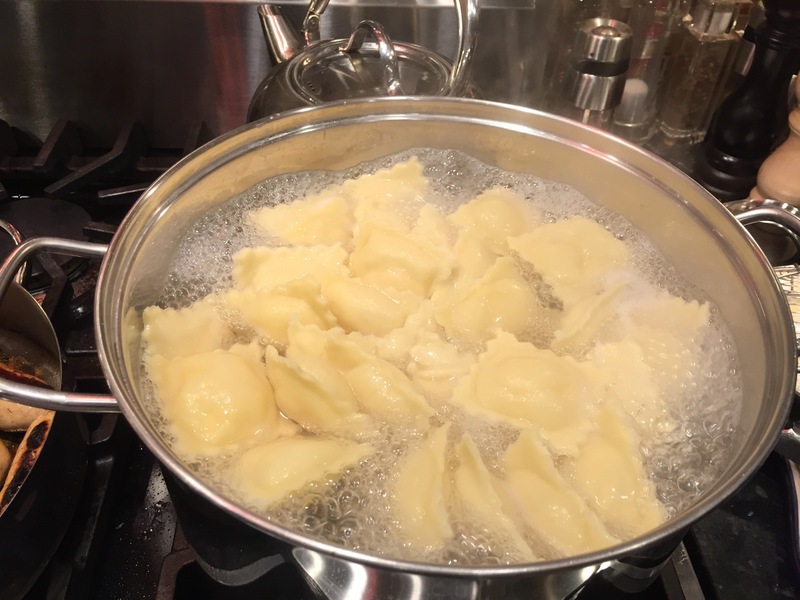 Add the kosher salt, gently drop in half of the ravioli and cover the pot. 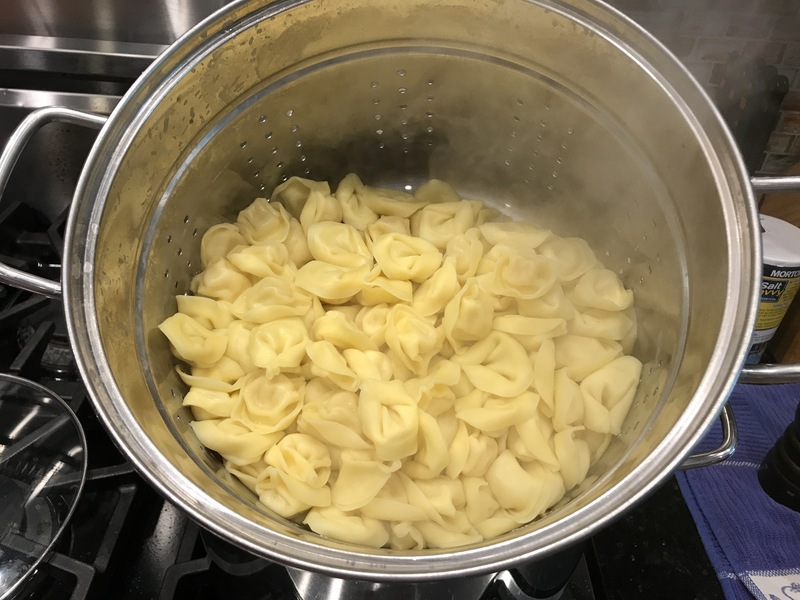 When the water returns to a boil, uncover and cook, stirring gently occasionally and reducing the heat as needed to prevent the ravioli from knocking against one another and breaking. The total cooking time should be 3 to 5 minutes. 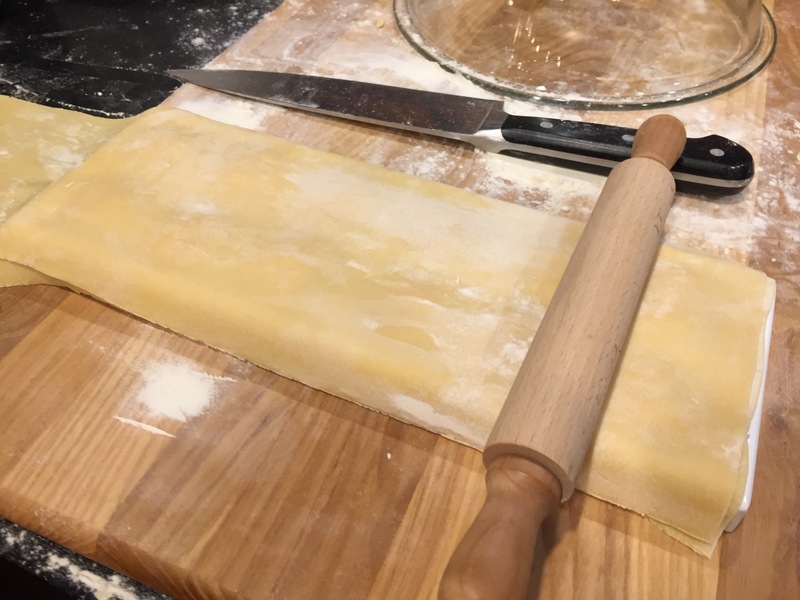 To test for doneness, transfer a single raviolo to a cutting board and cut off a corner with a paring knife; if the pasta looks cooked through and the corner tastes tender, the pasta is done. 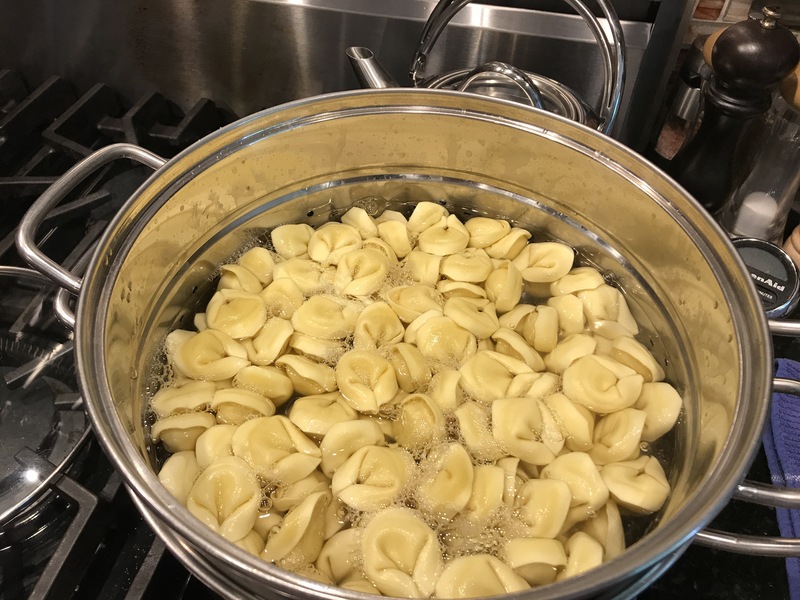 Using a large slotted spoon, lift out the ravioli, allowing a little of the water to cling to them so they remain moist, and transfer to a warmed large, shallow serving bowl; cover the bowl to keep the ravioli warm. 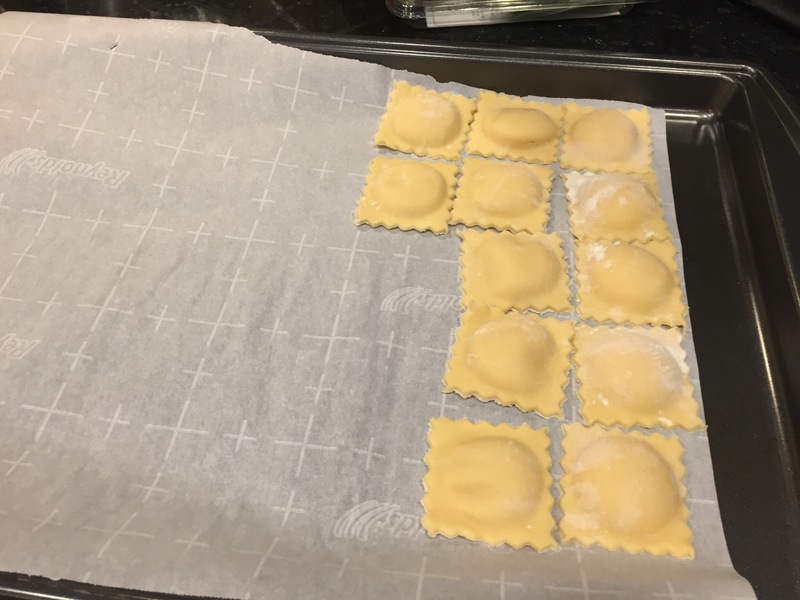 Repeat to cook the remaining ravioli. 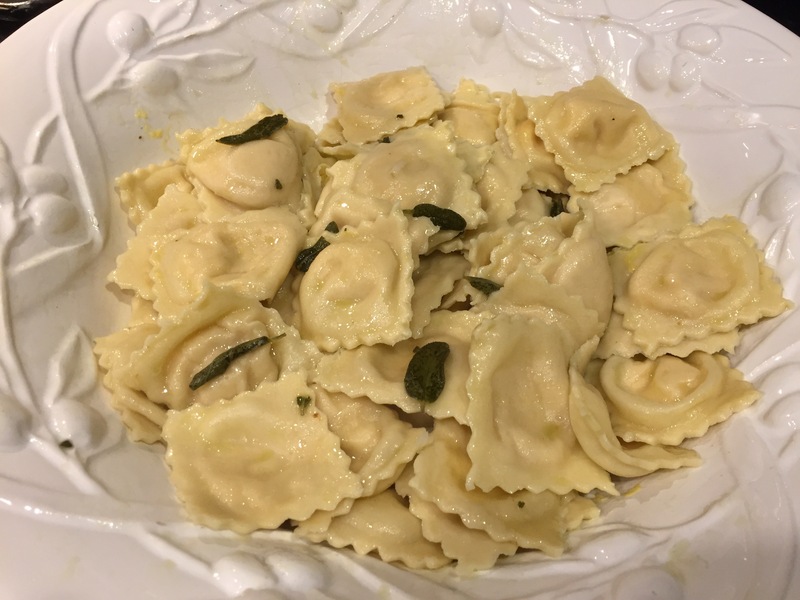 Drizzle the sage butter over the ravioli and serve immediately. Pass the cheese at the table. Serves 6. 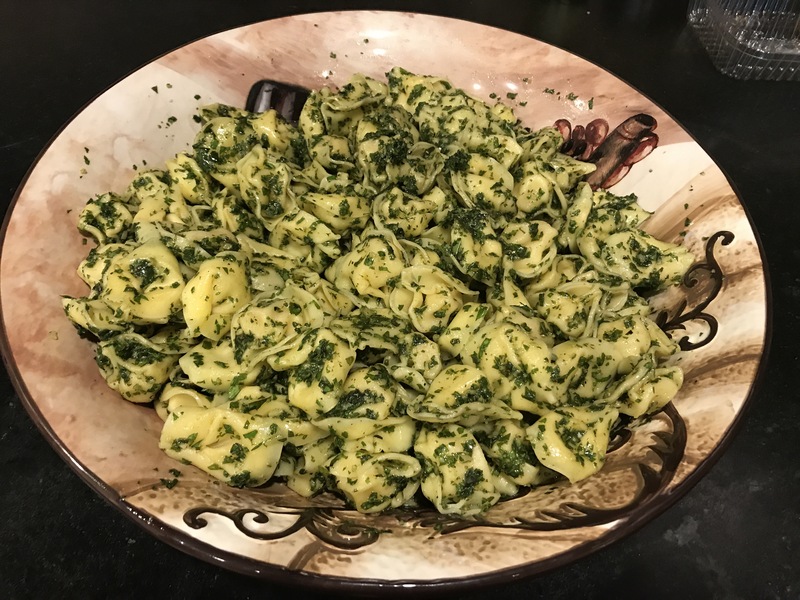 Serves 6 with no leftovers (~8-9 ravioli per person); I recommend a double batch of pasta and a triple batch of the pumpkin filling when making pumpkin ravioli so there are leftovers or ravioli to freeze. I considered writing up Sunday dinner; it was really good, but I think it’s important that everyone know how to prepare a spaghetti sauce from scratch as I did this evening. I was recently discussing this with a friend who is switching to a lower salt diet, I suggested to her how to make a basic tomato sauce with fresh tomatoes. I don’t use a recipe for sauce, I just tend to start cooking. 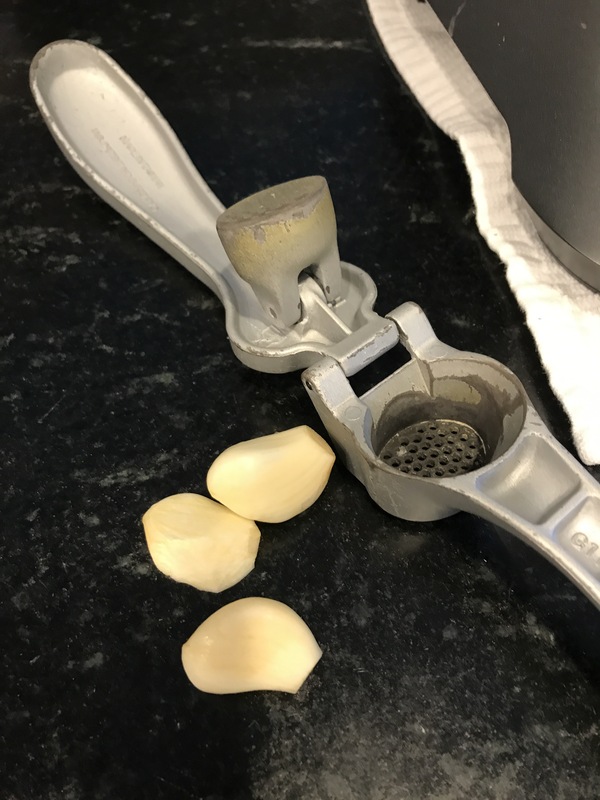 The basics are of course garlic and tomatoes – where you go from there is up to you. 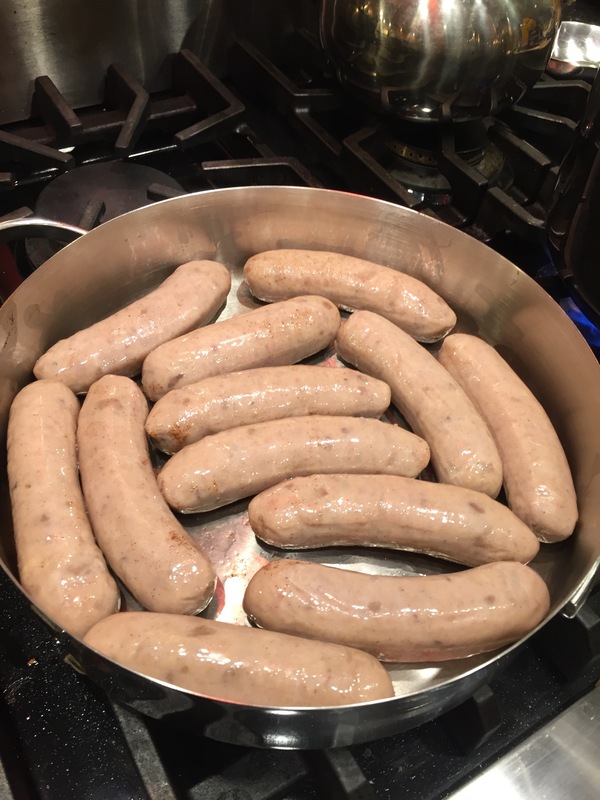 For tonight’s dinner I also picked up some fresh sweet Italian sausage that I started on the stovetop, with a simmer in red wine and water, once the water was mostly reduced I put the whole pan in the oven to brown up the sausages. While they were simmering I started my sauce. I decided on a kicked up vodka sauce based on the ingredients I had on hand. In addition to the garlic, I included dried porcini mushrooms, proscuitto, and a shallot. 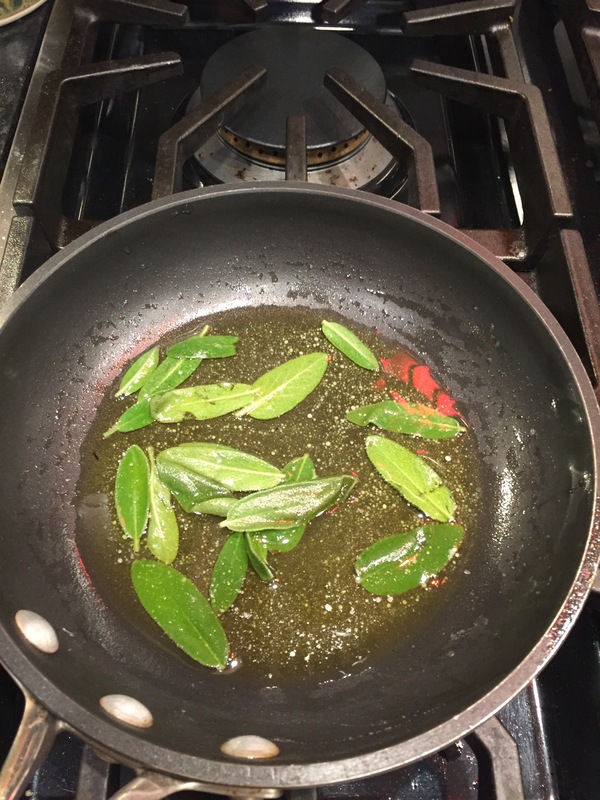 I always start my olive oil first, and make sure it’s hot (shimmering, but not smoking) before I add any ingredients. I typically start with garlic but bacon, or in this case proscuitto, comes first. And then the garlic with a healthy dose of pepper flakes (I ended up adding more) followed by the shallots and mushrooms. Once those had a yummy scent I added crushed tomatoes. And vodka (4 oz. per 28 oz. can of tomatoes). And after a quick stir I let it simmer. Ultimately, I stirred in cream (2 oz. per 28 oz. can of tomatoes) and Parmesan into the sauce, made penne pasta, sliced up the sausages, and stirred it all together with the sauce (adding just as much as needed/desired). Dinner is served, I have lunches for the week, and extra sauce for another use. With a Caesar salad and a glass of wine – perfect. My sister asked me about this recipe today so I thought I would share. 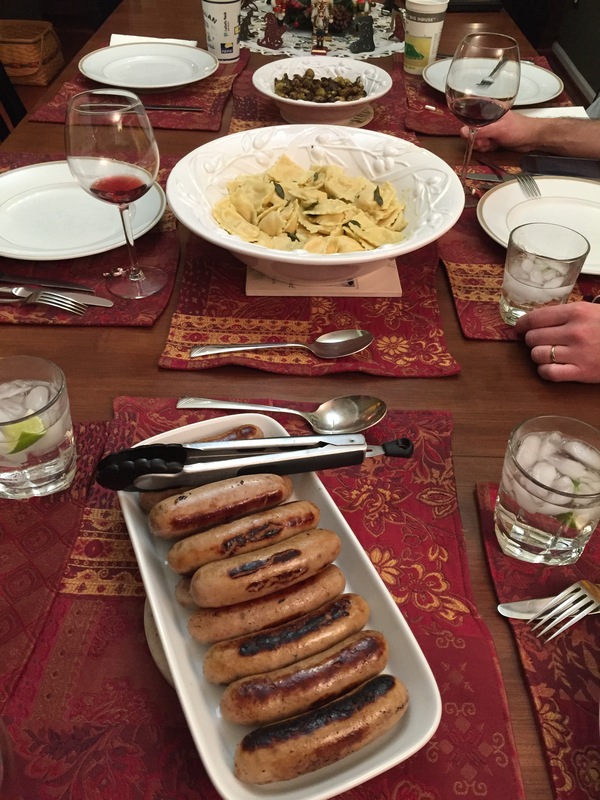 This was our Labor Day feast in September. It serves a crowd so scale it back if you are a smaller group. We used the burner for a turkey fryer and a large pot to make it work; definitely something you want to cook outside when the weather is nice enough to to not cool your pan as you cook. In a very large stockpot, stir together the potatoes, onions, chives, bay leaves, thyme, garlic, salt, and pepper and cover with the beer. 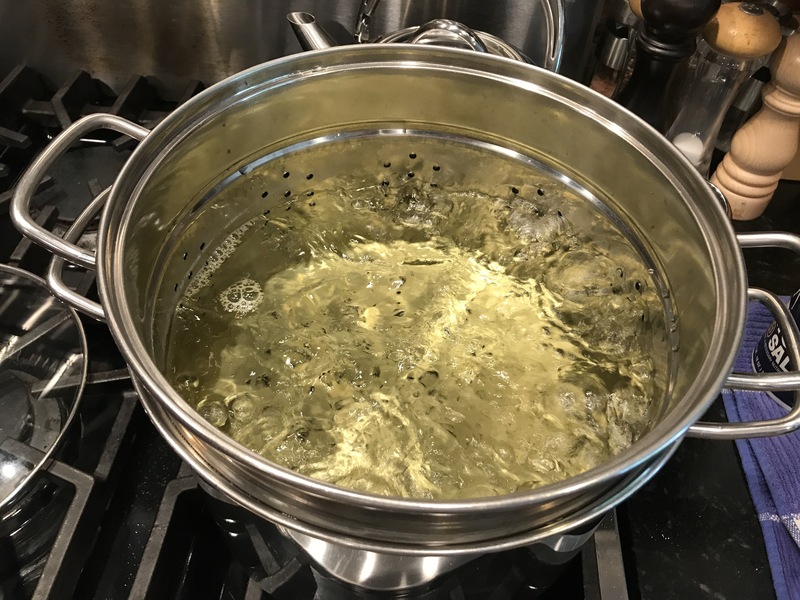 Cover the pot and heat to a boil and then simmer until the potatoes are almost tender, 20 to 30 minutes depending on the size. Add the sausage, nestling each piece into the broth. Top with the clams and green onions, then the corn with the parsley. Cover and cook until the clams begin to open, 15-20 minutes. 5 minutes after adding the clams, add the shrimp. Remove from heat when the clams have opened and the shrimp are done. Serve with grilled garlic-buttered sourdough bread. Late fall, when it begins to really cool off is always the time that my appetite goes to soups, stews, and crock pot recipes. 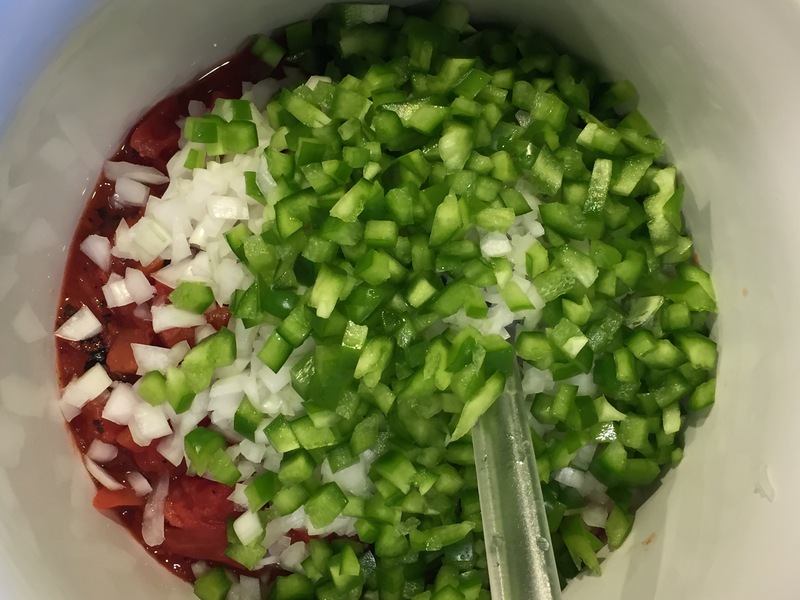 One of my favorites is jambalaya, it may not be a traditional recipe, but I really enjoy this crock pot recipe. Today it gave me the time to pay attention to my son and his new girlfriend in the famility room while I made pies, one for dessert, one for a friend’s birthday tomorrow, and a third just in case we need more. stir in the shrimp and parsley and you are done. I prefer this as a weekend meal since it isn’t good if it’s in the crock pot for 9 hours (my minimum time away from home on a workday; and I’m not actually fond of eating at 5:30). 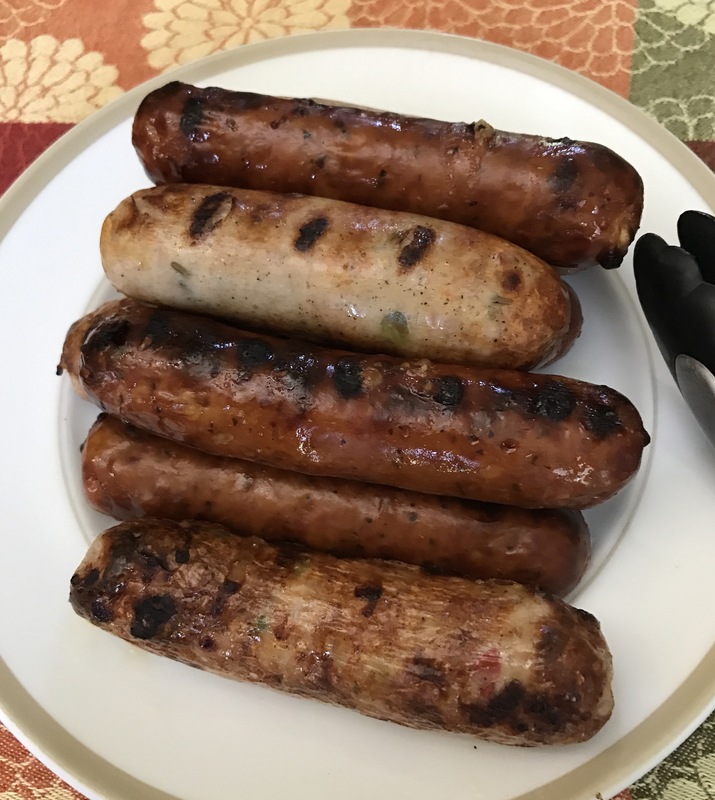 The recipe is very amenable to to changes based your preferences; I am a bit heavy handed with the shrimp and kielbasa, I have also used andouille…play with it so that it matches your taste preferences. 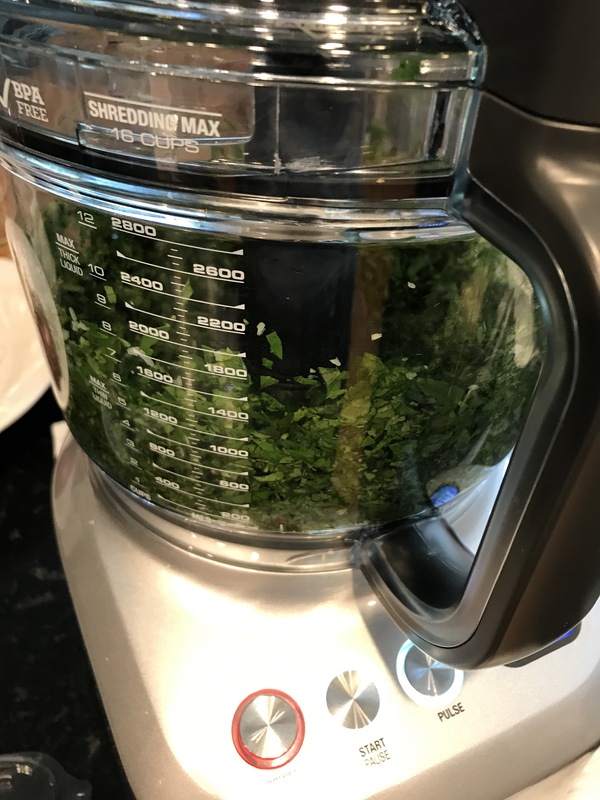 In 3½- to 6-quart slow cooker, mix all ingredients except shrimp, parsley, and rice. Cover; cook on low heat setting 7 to 8 hours (or high heat setting 3 to 4 hours). 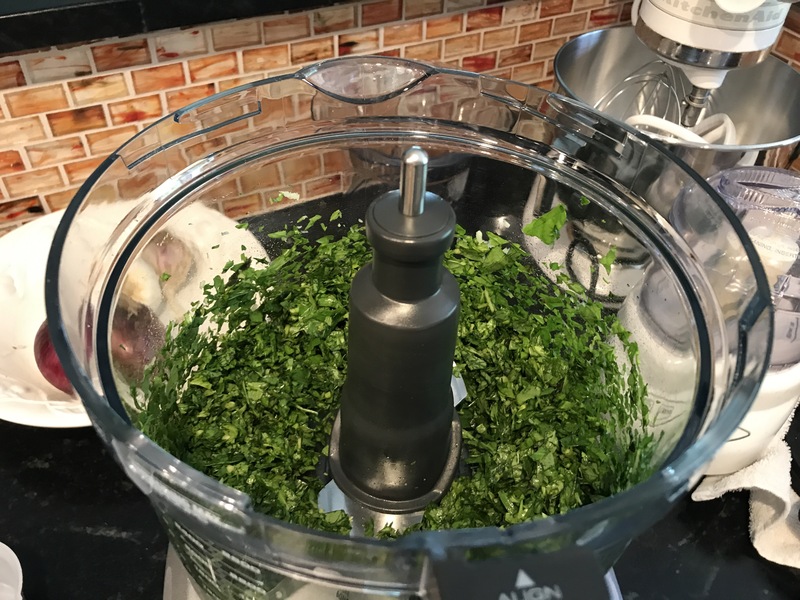 Stir in shrimp and parsley. If needed, reduce heat setting to Low; cover and cook on Low heat setting about 1 hour longer or until shrimp are pink and firm. Serve jambalaya with rice. Spicy and smoky, andouille sausage is traditionally used for this dish. If you’re in a more mellow mode, leftover ham works just as well. 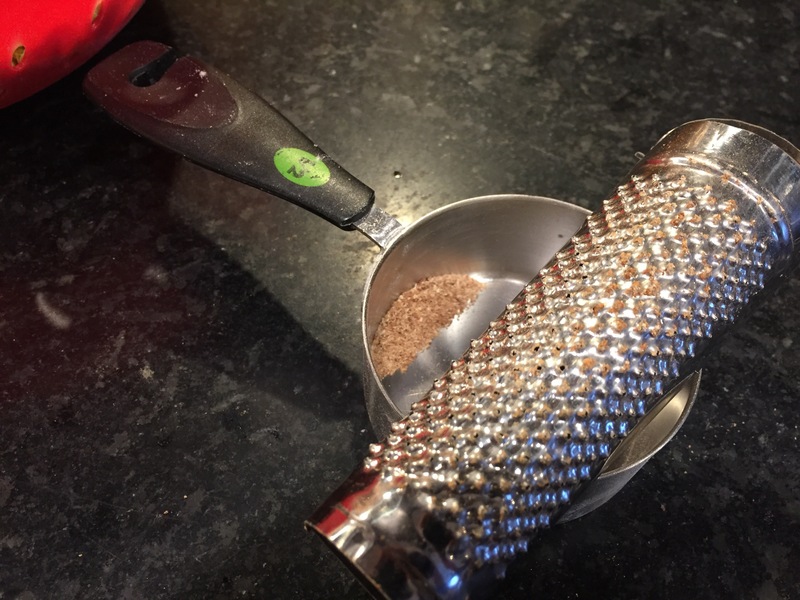 Spray the inside of a 1/2-cup measuring cup with cooking spray. For each serving press the hot rice into the cup. Place the cup upside down in the bottom of a bowl, and unmold the rice. Spoon the jambalaya around the mound of rice. 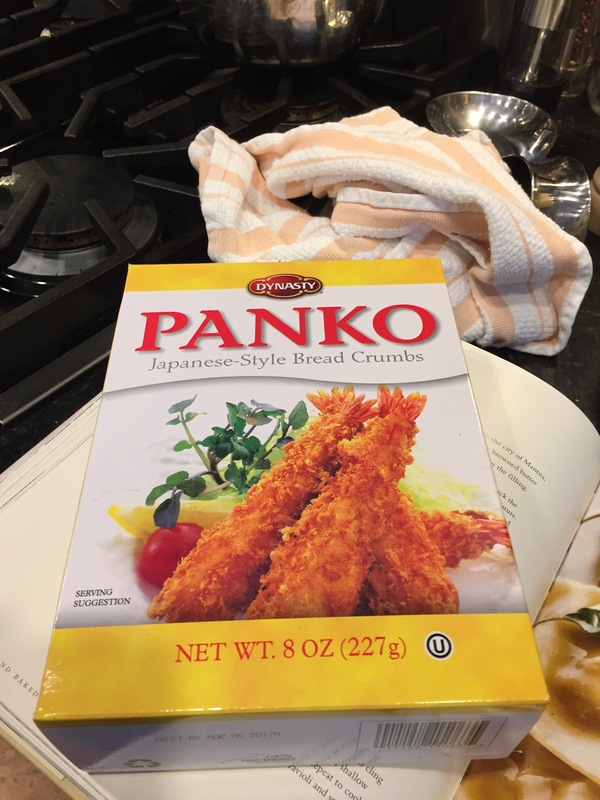 Serve with warm crusty French bread. I have discussed my apple pie before with my mother’s crust recipe, my own recipe is slightly different. For my mom, “easy as pie” is a meaningful phrase. Sadly, for me, not so much. My hands are very dry and I cannot “feel” the crust as she describes. So after playing with a number of recipes, I modified hers to include both butter and Crisco. This gives it the desirable flakiness associated with a Crisco crust and the manageability of a butter crust. 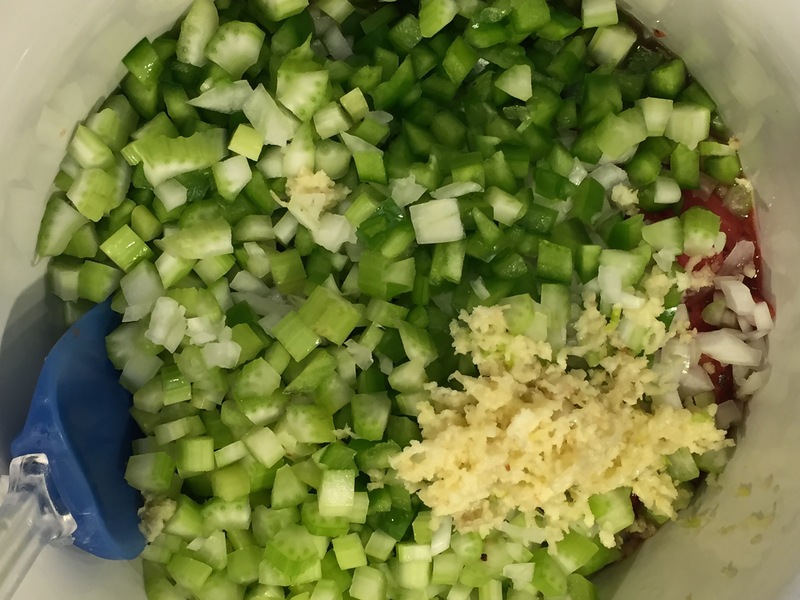 It can be mixed in a food processor…easy. 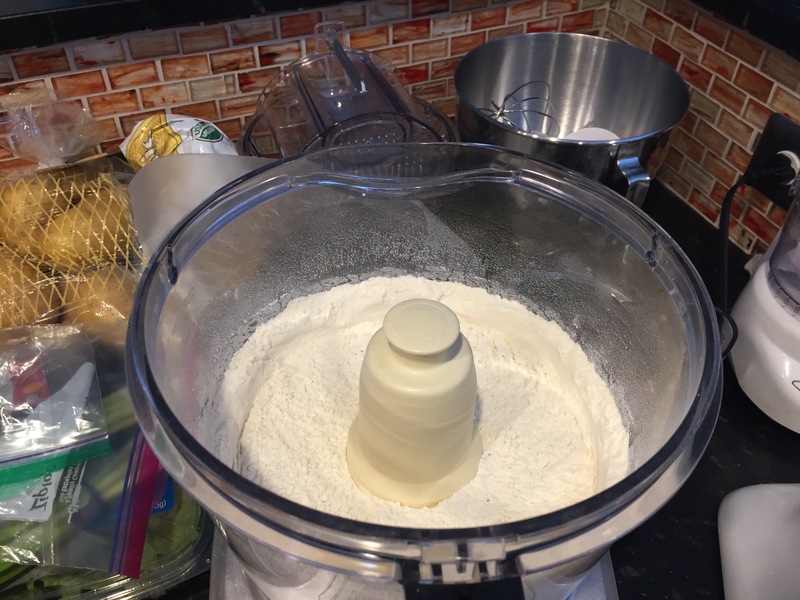 Mix flour and salt together in a food processor. 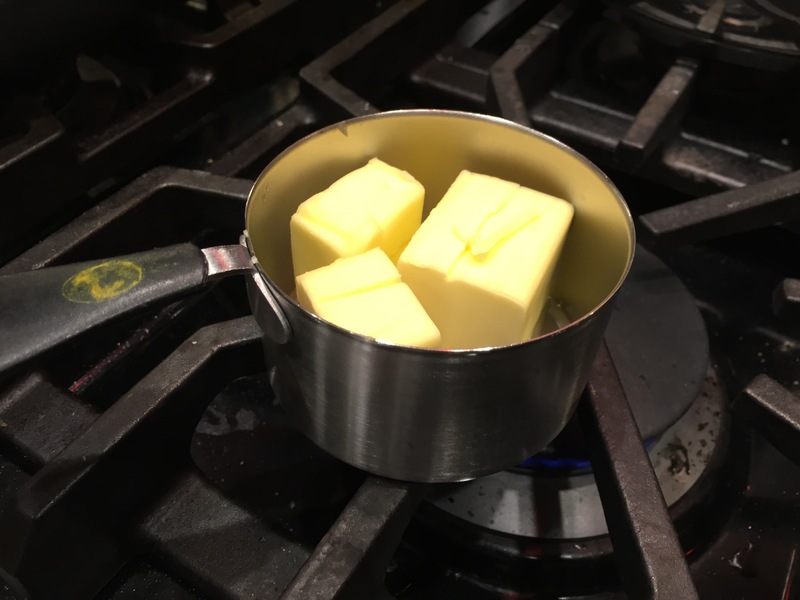 Add half of the Crisco and half of the butter and process until just combined. Add remaining Crisco and butter and mix until crumbly. Add water slowly while pulsing the processor. Pour out dough onto a very lightly floured board and shape into a disk. Split into two pieces (slightly larger for the top crust) and shape into 5-6″ disks. Wrap each disk in saran wrap and chill for at least 30 minutes. Use as directed in pie recipe. This recipe easily scales from 1 to 3 double crusts. Tonight (yesterday by the time I land and this posts) they are having pizza and salad with enough extra ordered to fill lunchboxes with cold pizza all week. 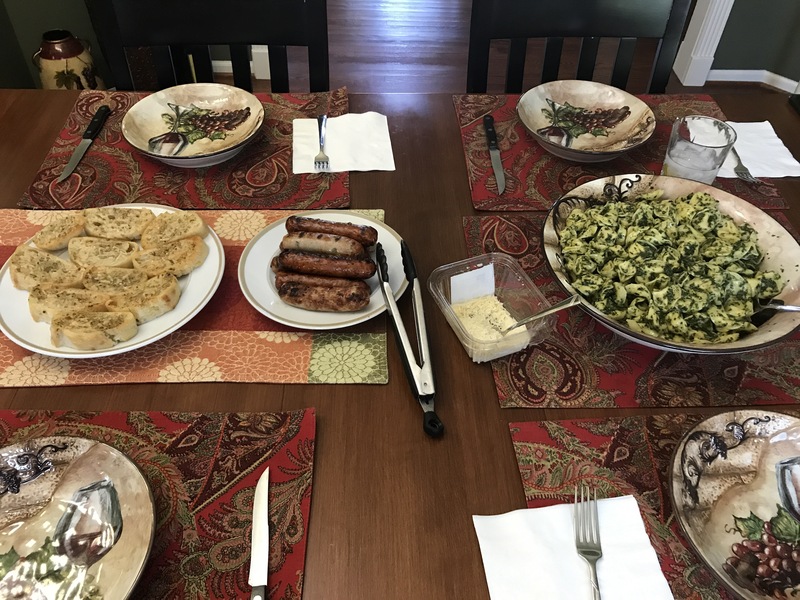 Last week when I made my son’s 17th Birthday Dinner, I made extra (not intentionally, I was following the general rule of 1 pound of meat per person if “bone-in”, although my family would simply tell you that I always cook enough for 4 more people to join us). 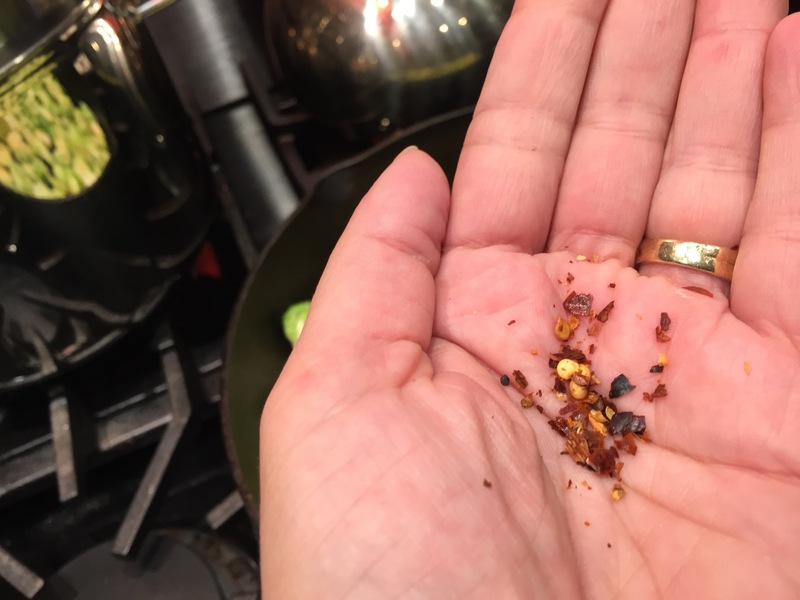 Rather than use it as any sort of leftover, I decided to freeze the extra, all that my men will need to do is make some rice and a quick veggie and that will be one meal. Another meal will come from last night’s dinner, Grilled Chicken, Prosciutto, and Swiss Wraps, which I discovered once upon a time looking for things to do with leftover roasted chicken. Aside from my time spent on the chicken (this time I used a whole organic rotisserie chicken), the recipe takes about 15 minutes total including cooking time. A whole chicken is a double recipe, and my normal practice. I don’t often measure any of the ingredients as a touch more or less of any won’t impact the final result. The only exception is the chicken, if you have way too much it will be dry, this is easily corrected, just add more of everything else too. Tomato paste in a tube! Keeps in the fridge, measures well, and no can opener needed. I have seen and used a few different brands, this is just the one that I have right now. I’ll be in Spain this week, so not cooking, but I will try to post the meals that are unique. One of the nice things about traveling for work is indeed the food. 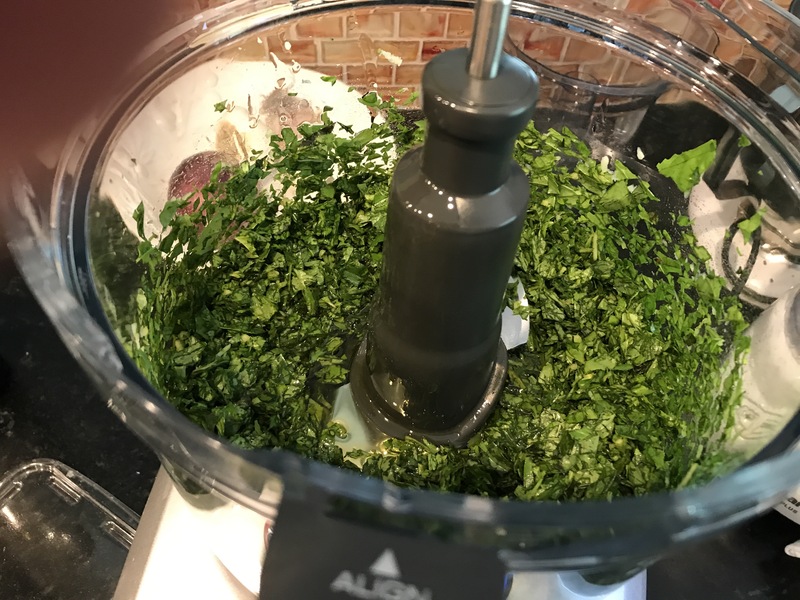 This is my introduction to ingredients and foods that I haven’t tried before. I still follow the rule my mother taught me when I was young, essentially “When in Rome, do as the Romans do”, but in our house this also meant when you visit someone, eat what you are served. I extrapolae this when I travel, and try to eat local cuisine. Poultry, Quick Meals, Sandwiches, Tested and Approved! 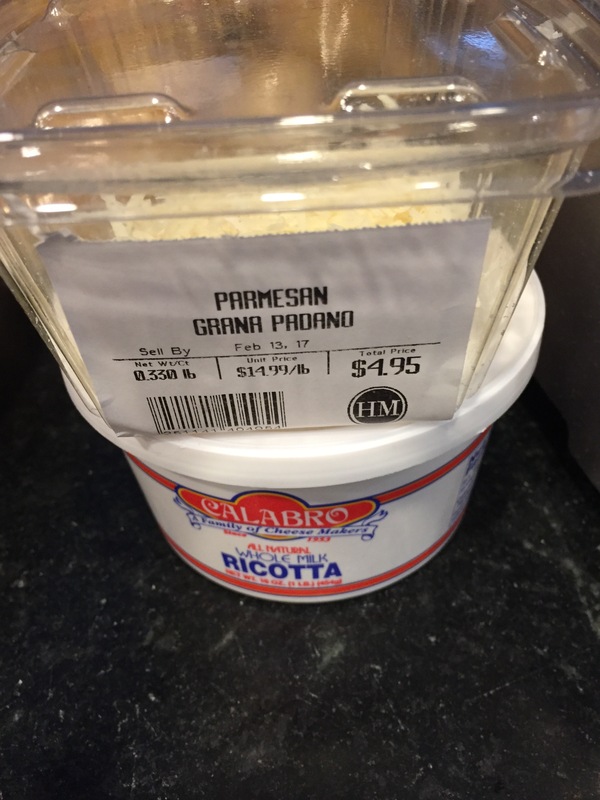 Combine mayonnaise, garlic, dijon, and capers in medium bowl; mix well. Add chicken to bowl; stir to coat. To assemble wraps, divide the prosciutto evenly between the four wraps, layering as necessary and leaving a 1″ edge. 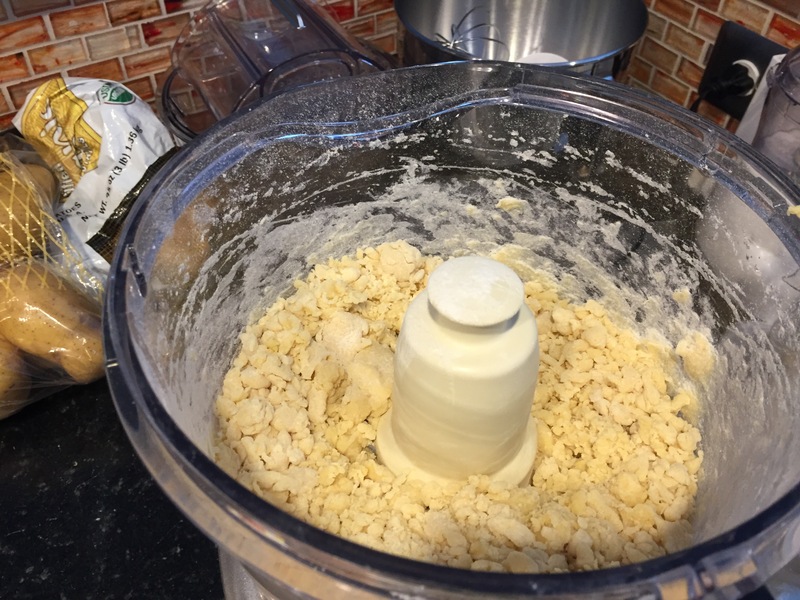 Top each with ¼ of the chicken mixture and ¼ of the cheese. Fold in sides of tortilla and roll up tightly, burrito style. Preheat grill pan with grill press (or panini press, Foreman grill) to medium heat. Place wraps in pan; top with press and cook 5 minutes per side or until grill marks appear. 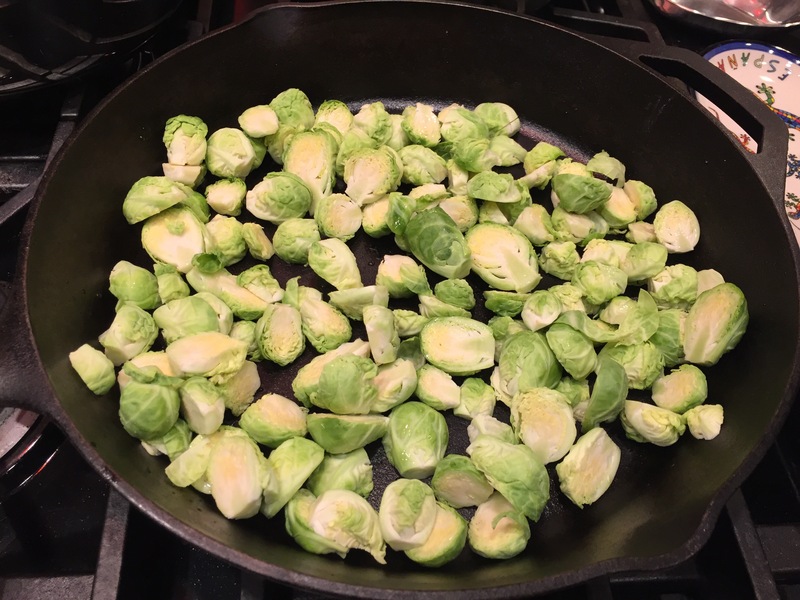 Remove wraps from pan; cut in half on a bias and serve immediately. Warming the tortillas will make them easier to roll up. To warm tortillas, place them between paper towels and microwave on HIGH 30–45 seconds or until warm. Any leftover chicken will work – the taste will change depending on the spices used when cooking it. Entrées, Soups Stews etc., Tested and Approved! Spoon chili into bowls. Top with sour cream and cilantro and serve.